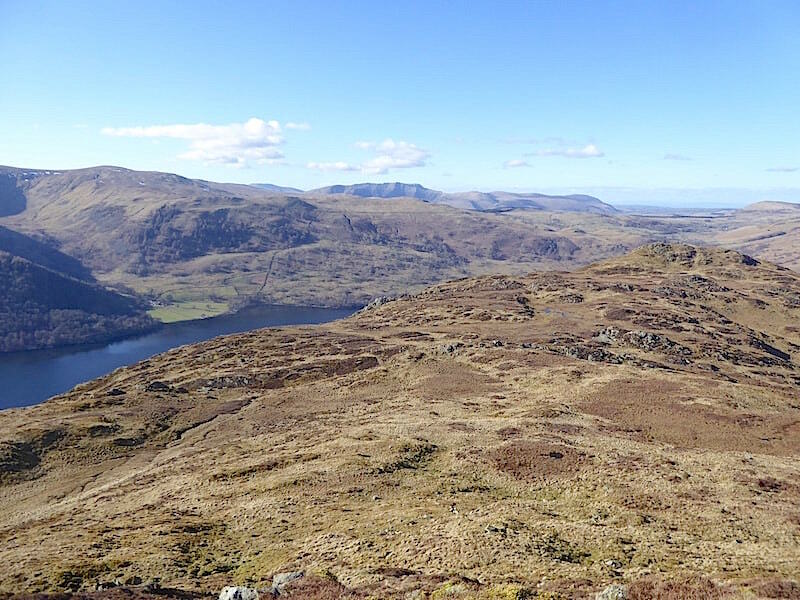 We’ve taken walks on Place Fell, using a variety of routes, a number of times over the years, almost always going straight to the summit from whatever starting point we had chosen. 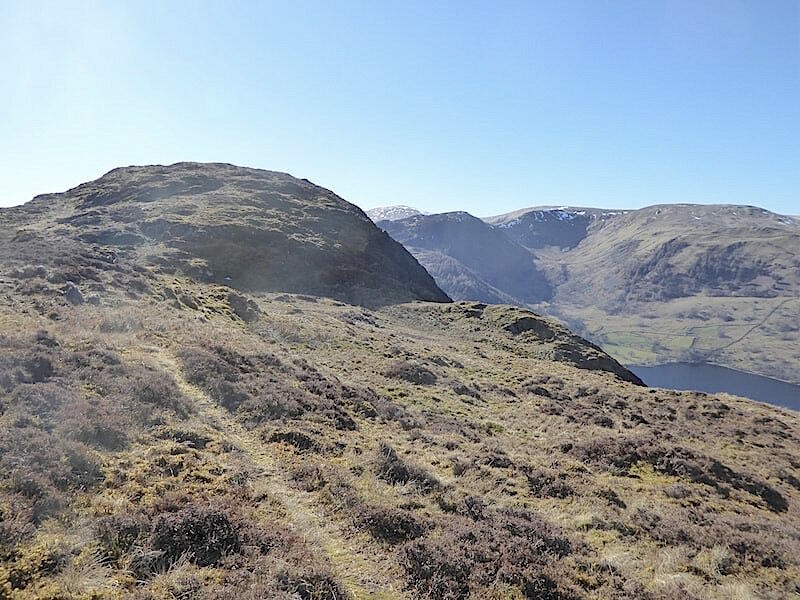 Today we thought we’d do something a little different and take a circular route to visit some of Place Fell’s subsidiary tops, most of which we hadn’t set foot on until today. 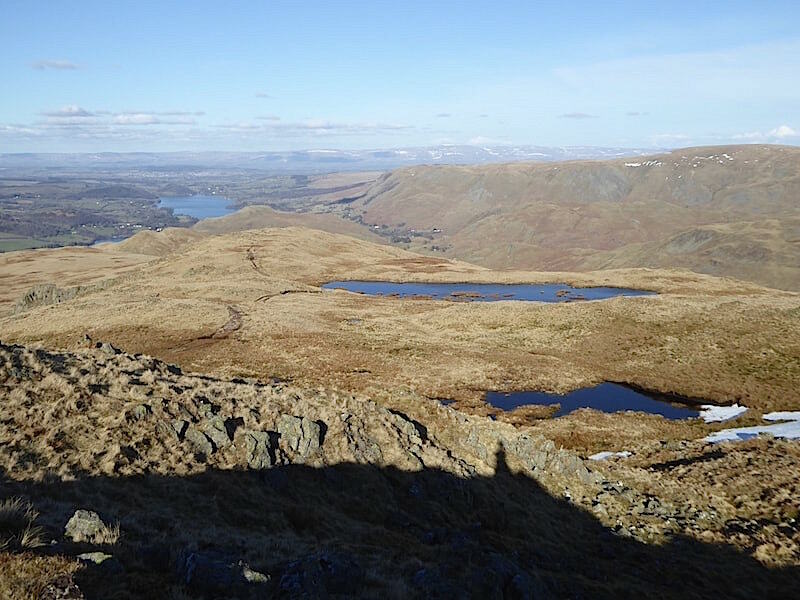 In terms of mileage it isn’t a very long walk but climbing one subsidiary top after another all the way up to the summit of Place Fell itself isn’t the easiest or most straightforward way to reach it and it can be a bit of a slog at times. Paths are either indistinct or non-existent for quite a bit of the climb to the trig point on Place Fell, there are numerous marshy areas to try to skirt around, and dead bracken in many places indicates that its probably a route best walked before the bracken really takes hold and begins to fight back. 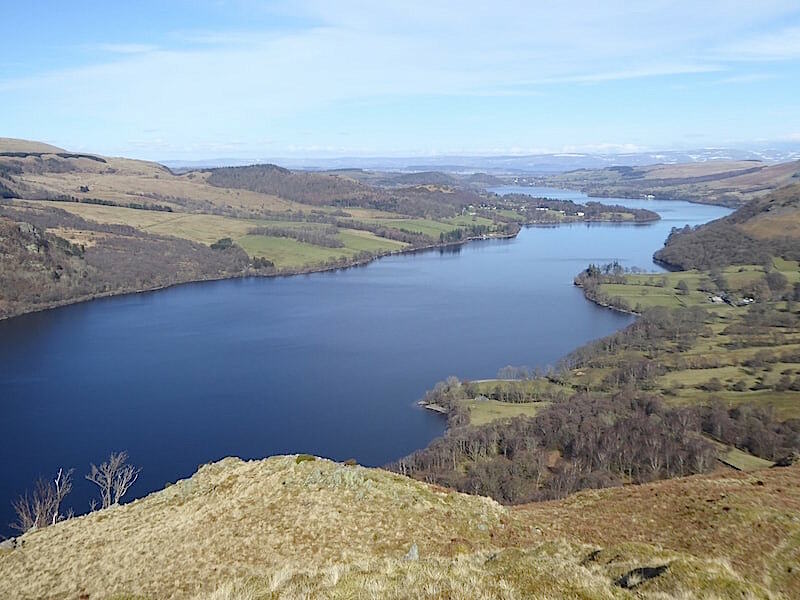 The forecast indicated that the day would turn out dry and sunny later on in the morning and, as we had things to do during the morning, we decided we’d do this walk during the predicted sunnier afternoon. 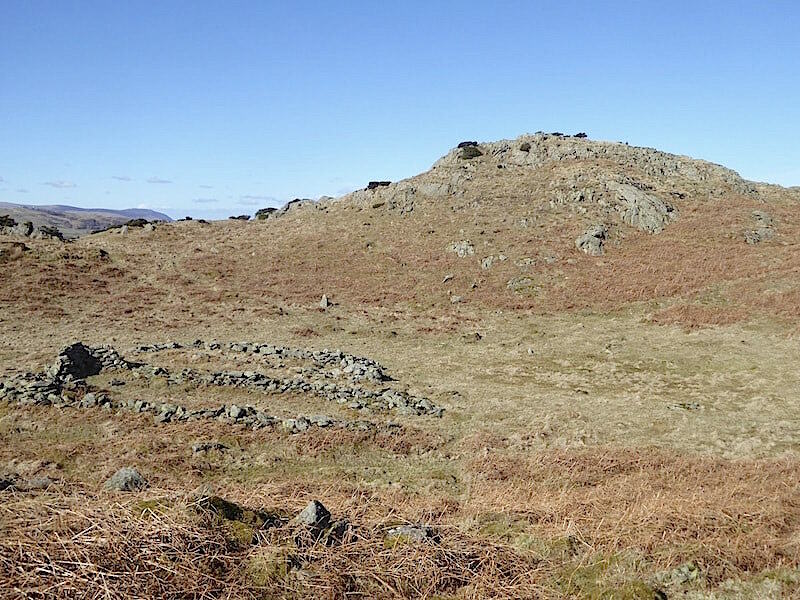 We had an early lunch then, with a flask of coffee and some snacks and fruit stowed into just one pack, we drove the short distance from home over to Sandwick, the starting point for our Grand Tour of Place Fell. It was just after one o’clock when we set off from our off road parking spot just above Sandwick. The road drops down into the little hamlet at the end of the road where there are a few roadside parking spaces available which naturally were all occupied given the time of day we had chosen to arrive. Its not a cause for concern though as a roadside parking spot can usually be found along here. 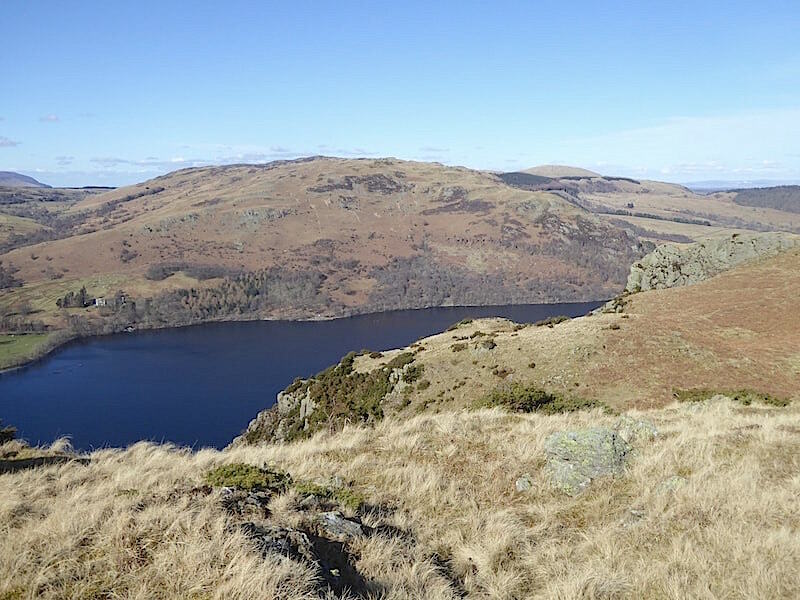 The path we start out on meets up with the one coming up out of Sandwick after just a short way and then continues along the eastern side of Ullswater, although not along the actual shoreline of the water. 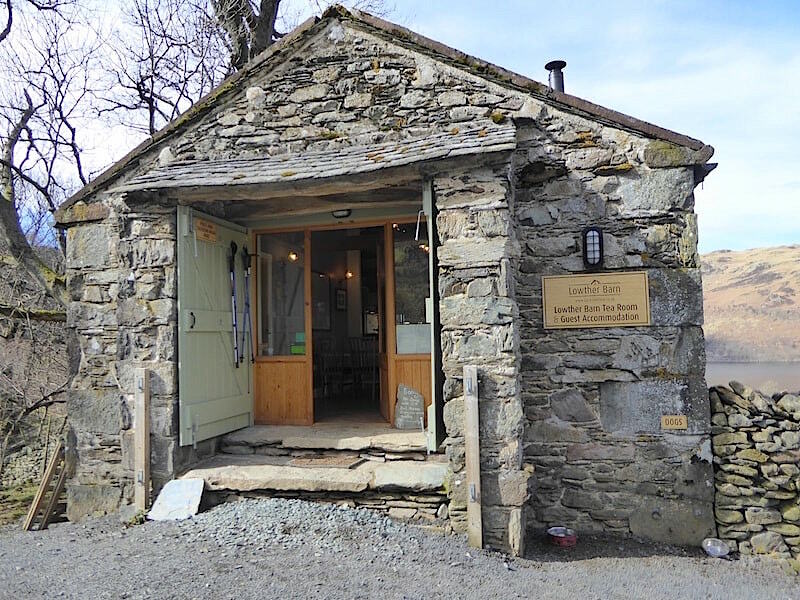 Further along the path is the Lowther Barn Tea Room which has a little tea garden from where you can enjoy a view of Ullswater and Gowbarrow Fell along with your tea and cake. Not being in need of sustenance just yet we carry on along the track with this view of Low Birk Fell directly ahead of us. 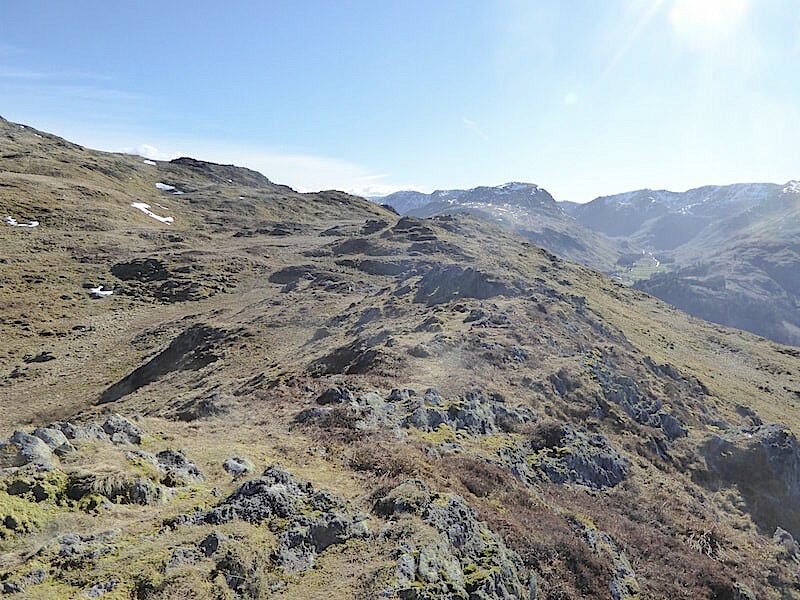 This will be the first of the subsidiary fells we will be climbing today. 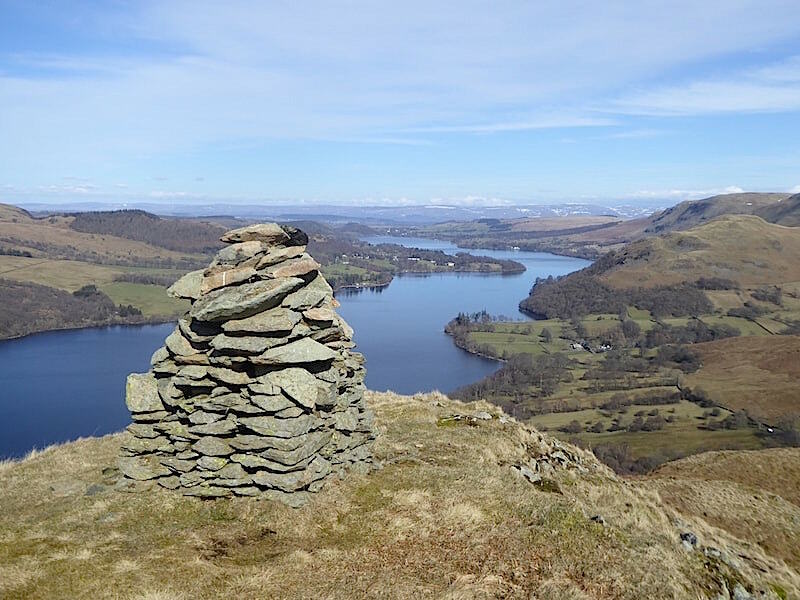 The path forms part of The Ullswater Way and continues on to Glenridding but we will turn off it at a wall corner just a little further along. 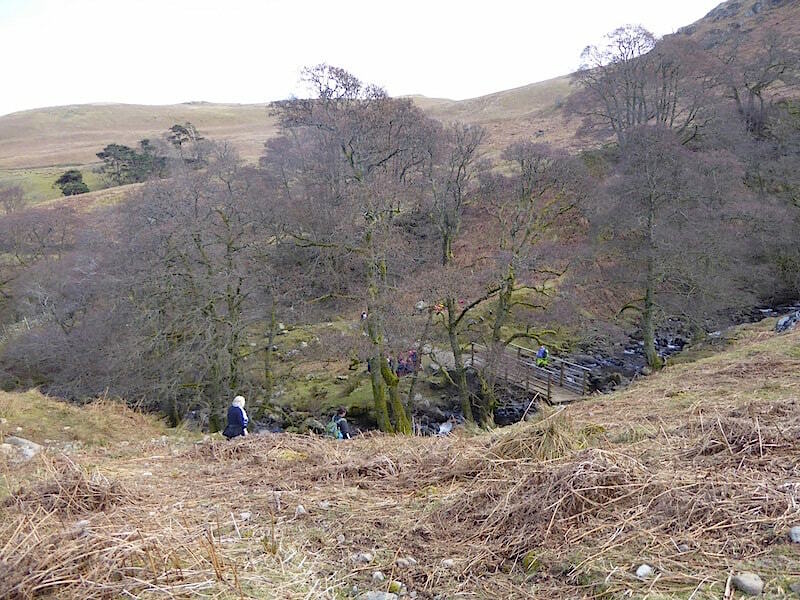 Looking back at the footbridge across Scalehow Beck. I waited until we were above the bridge to take the shot as the crossing was quite busy with walkers, plus a little group of very young gill scramblers listening intently to the instructor and no doubt eager to get on with the activity. As we crossed there was a group of ladies leaning against the rails, one of whom earnestly asked us if the tea room was very much further away, she and her friends looked relieved to learn that it was only a couple of hundred yards away. 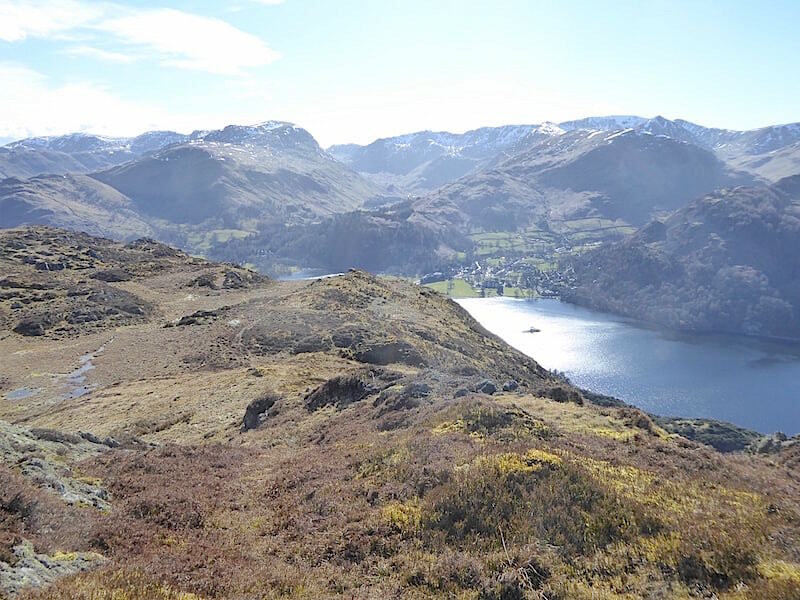 If they were walking from Glenridding to Howtown they probably needed some refreshment, its six and a half miles of undulating pathway with some steep ups and downs and plenty of rocky sections. The steamer trip from Howtown back to Glenridding will provide a relaxing ride back though. Bright sunlight directly above Scalehow Force got in the way of capturing a decent shot of the falls but at least they were visible thanks to the lack of leaves. 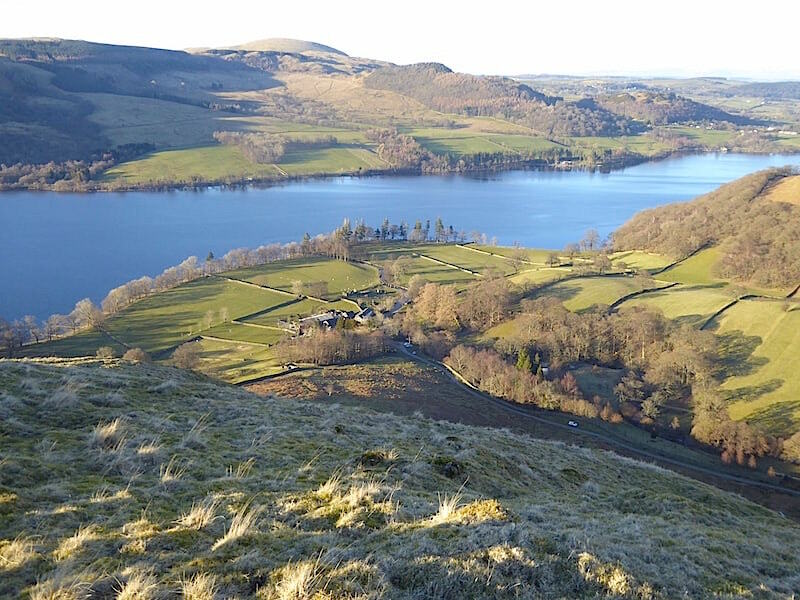 We’ve left the lake path now and started the climb up to Low Birk Fell. 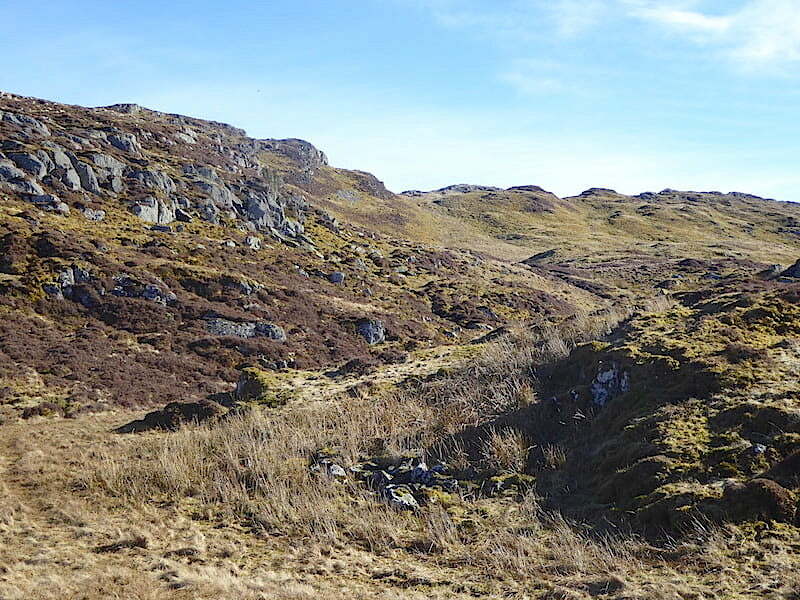 The start of the path from the wall corner is obvious enough but it quickly becomes indistinct, even with the bracken down, so its just a case of skirting the steeper craggy sections and continuing upwards. 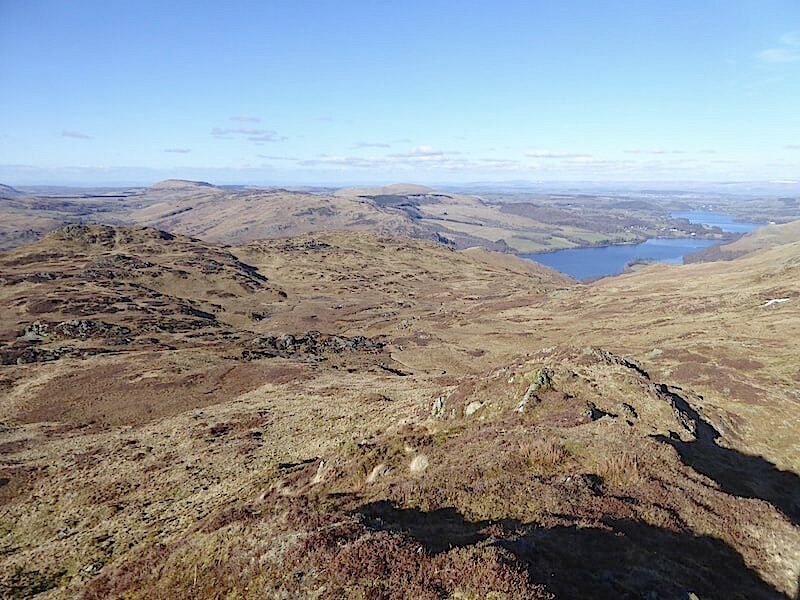 We have walked up Low Birk Fell in the past so we knew what to expect and the lack of waist high bracken today made the climb a little less fraught. 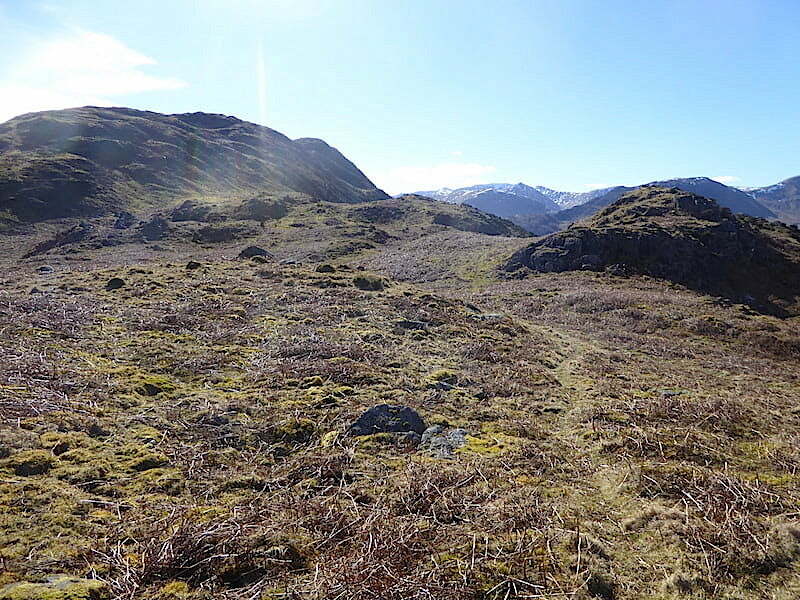 The holly bush indicated on AW’s Place Fell 6 drawn map, but which isn’t indicated on the OS map or our route map. 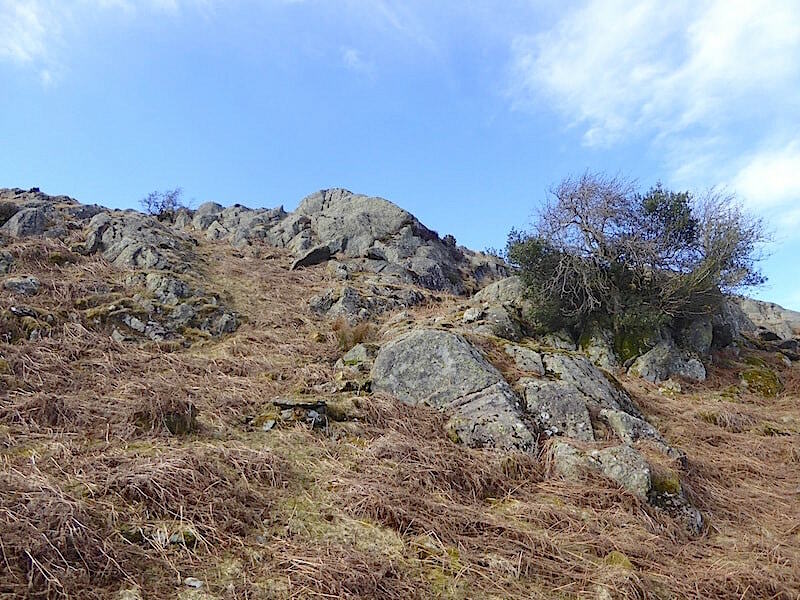 We climbed to the left of the holly along the grass/bracken area between the two lines of outcrop. Still climbing and a pause for a shot of High Dodd across Scalehow Beck. 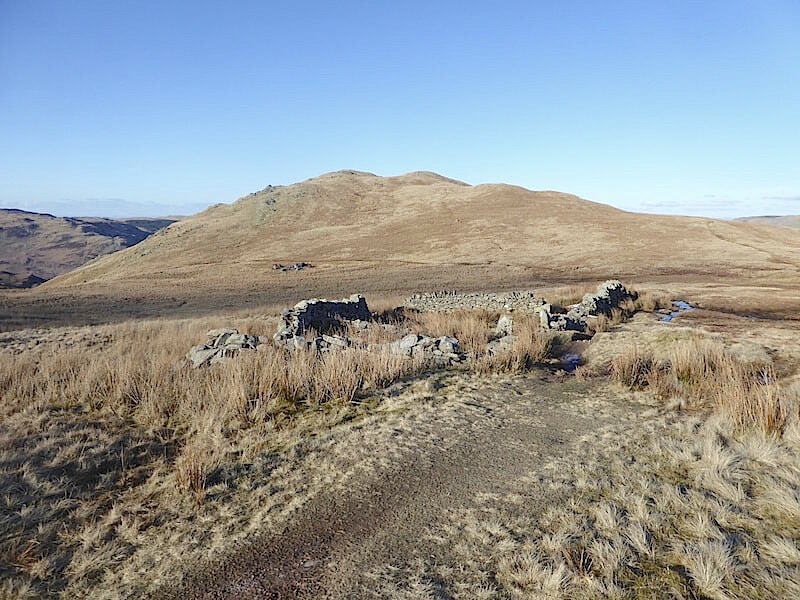 The path along the lower slopes starts at a stream just by the Lowther Barn Tea Room and carries on up to Low Moss where it joins the path for Place Fell summit. 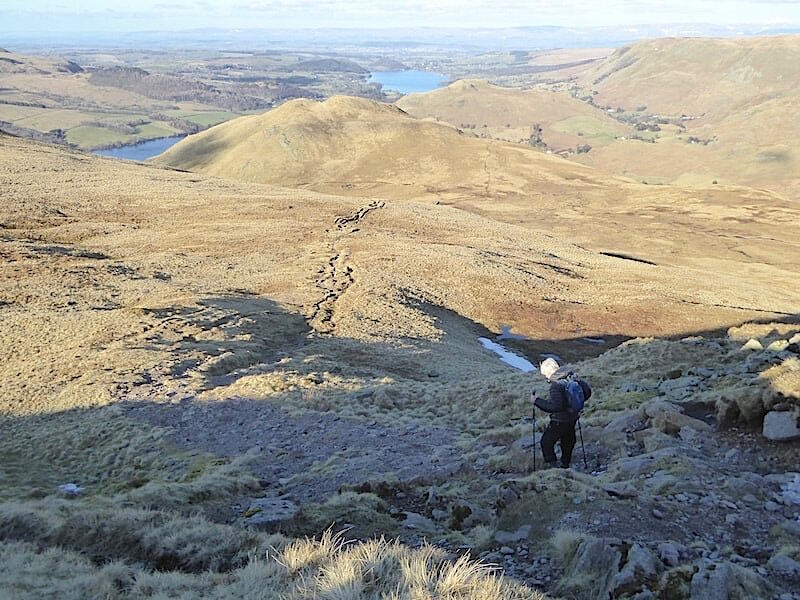 A much more straightforward route than the one we are taking if your only objective is to reach the top of Place Fell. 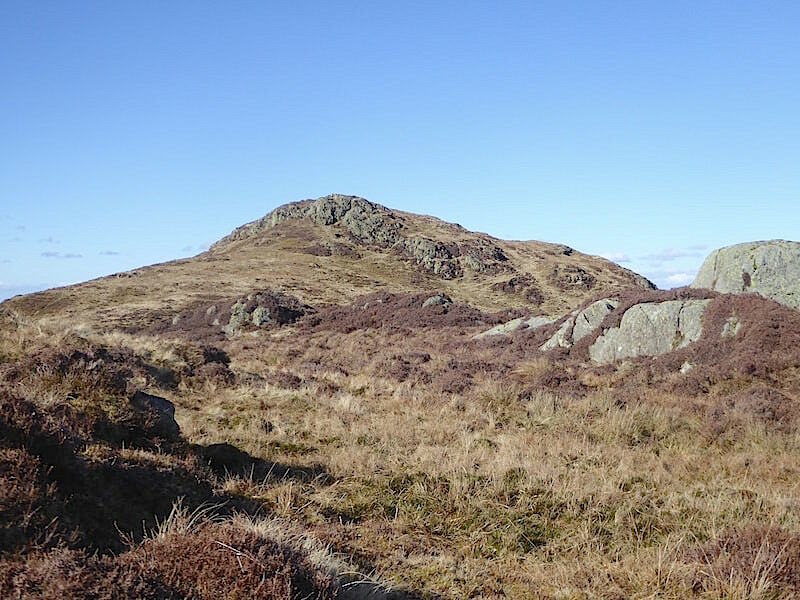 The rocky outcrop on the left is High Knott and between it and the summit of High Dodd on the skyline is Low Dodd. 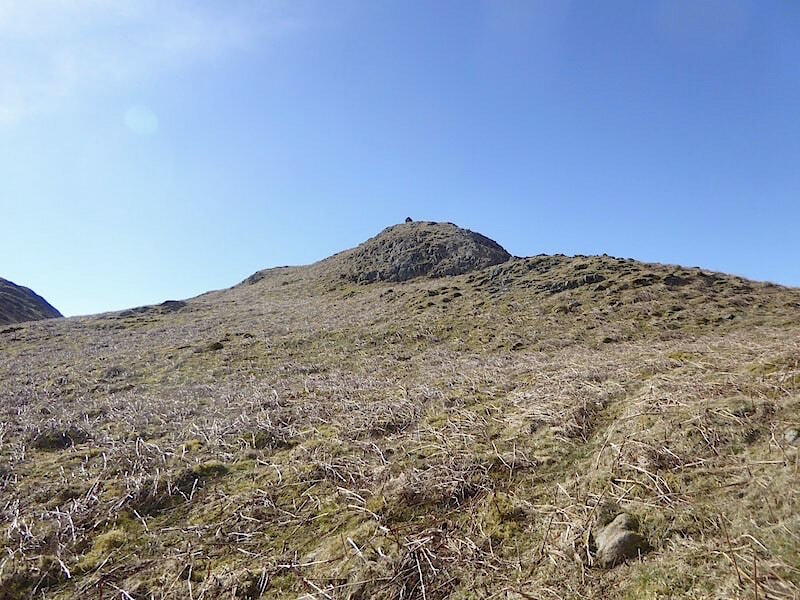 After a number of false summits the cairn marking the true summit of Low Birk Fell finally comes into view. We were now wishing that we weren’t wearing the winter weight trousers, our jackets had been removed ages ago. This was warm work despite the dormant bracken, its a bit of a nightmare when its fully grown believe me. 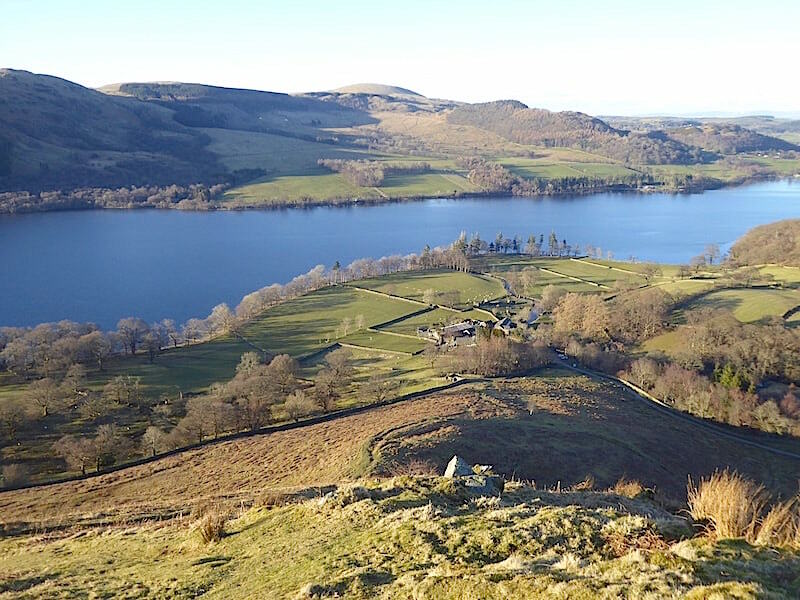 Still, the view from the top of Low Birk Fell is well worth the effort, especially on such a beautiful afternoon. 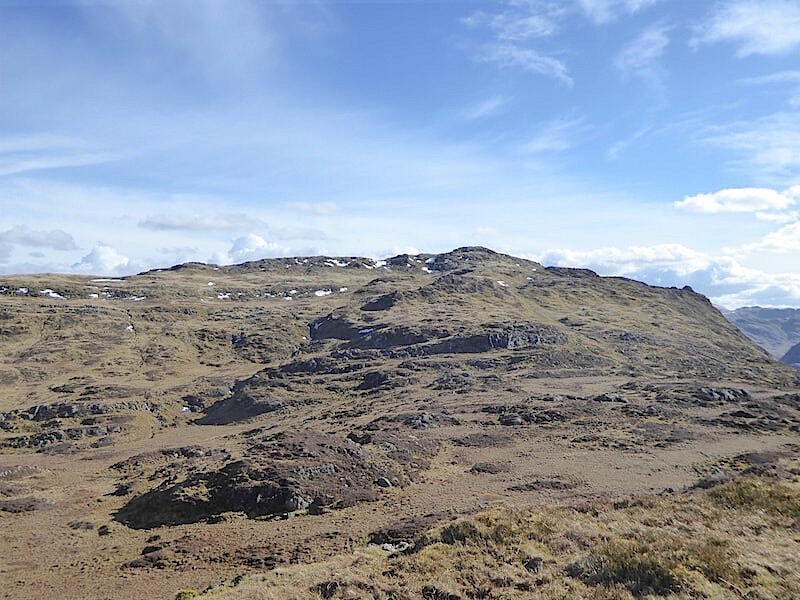 You could probably spend many a sunny summer day up here and not have your solitude disturbed at all by any other walkers. 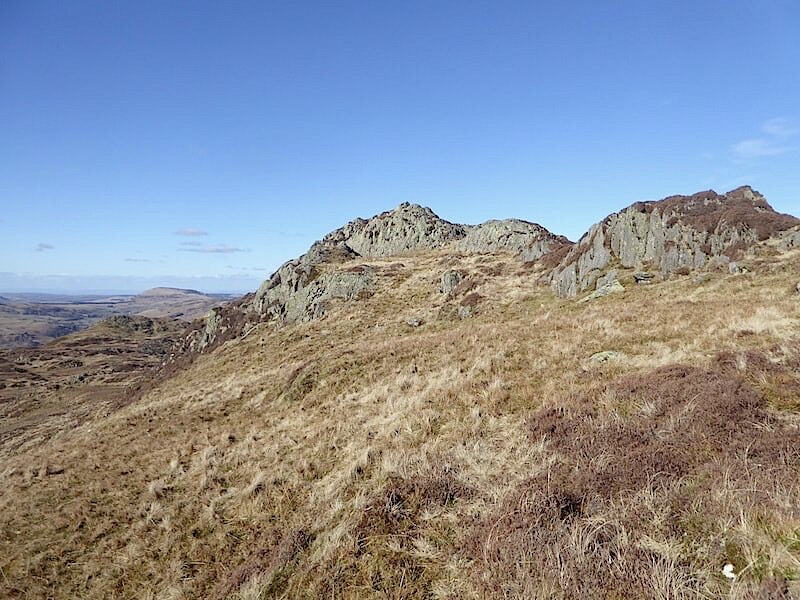 Its not in AW’s list of 214 fells or listed in his Outlying Fells so it doesn’t get a great deal of attention. 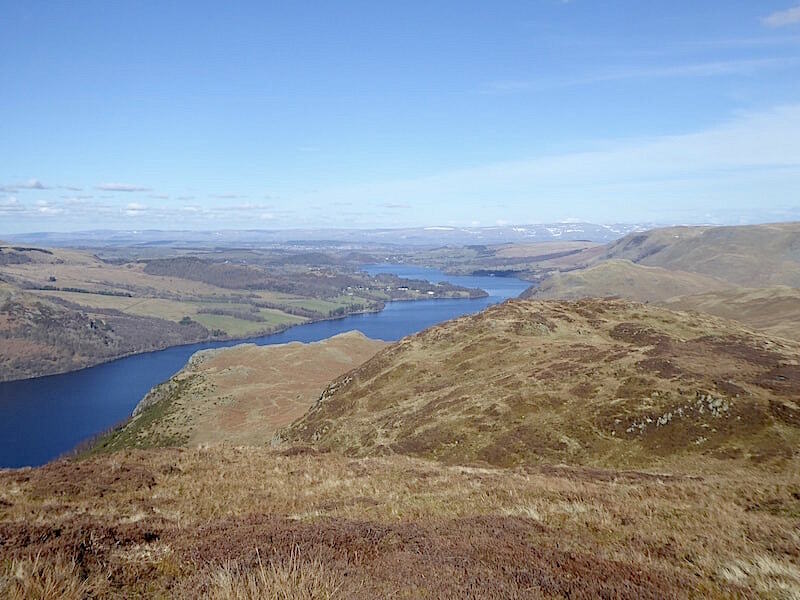 Perhaps it lacks the macho image of much higher fells but it is well worth a visit. 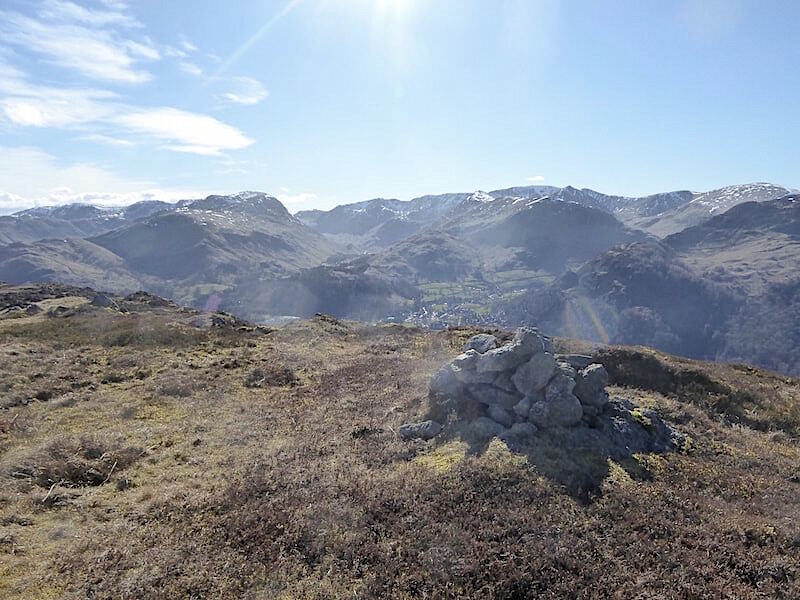 Here are a few views from the summit …..
….. in the centre, directly opposite us, we are looking at Stybarrow Dodd above the Glencoyne valley. Stybarrow is flanked on the left by Sheffield Pike and on the right by Hart Side …..
….. looking ahead we see Kilbert How, the low rocky area across the middle foreground, to the left of which are the slopes of Smeathwaite and Birk Fell, with the conical silhouette of The Knight to their left …..
….. immediately below us are a couple of the false summits on Low Birk Fell, while on the right skyline are Arthur’s Pike, Bonscale Pike and Loadpot Hill where we walked a couple of days ago …..
….. and finally the glorious view along Ullswater, what’s not to like? We tear ourselves away and continue on to Kilbert How across the flattened dead bracken with the sun blazing down on us, we should have packed our shorts because it was definitely a day to be getting your legs out of their winter lagging. Kilbert How is only a rocky cluster but it offers some different views of familiar places. 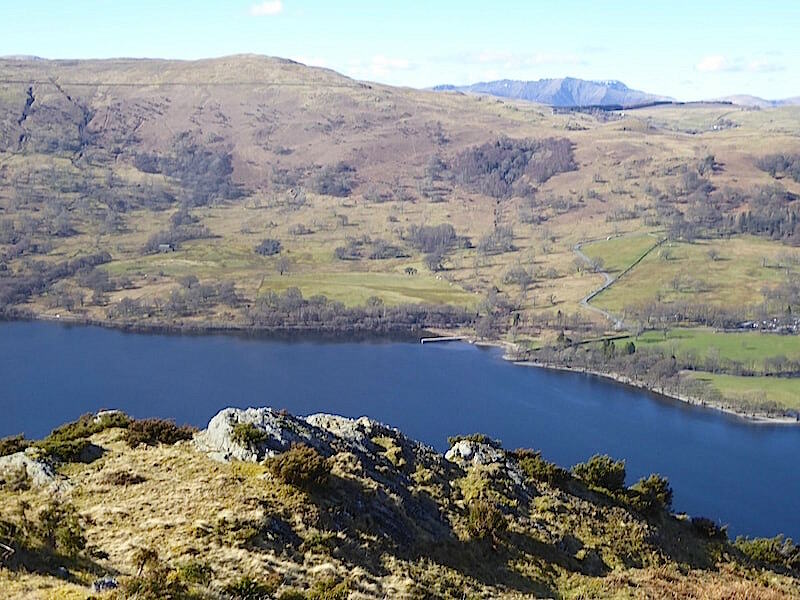 Below us on Ullswater’s western shore is the Aira Force jetty where the small launch from Glenridding offloads its passengers for their visit to Aira Force. Looming above the jetty to the left is Watermillock Common behind which Blencathra is beginning to put in an appearance. 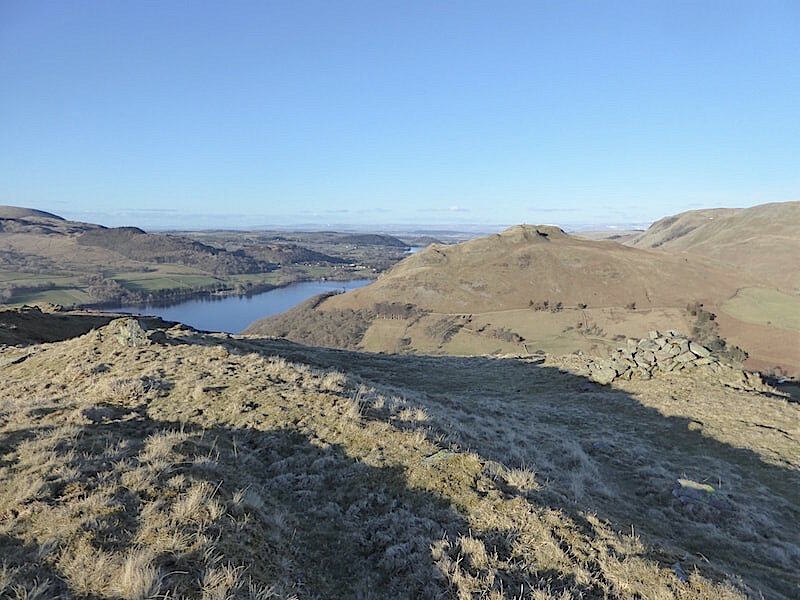 A little further to our left and we see Glenridding Dodd, Sheffield Pike, Stybarrow Dodd and Hart Side once again. 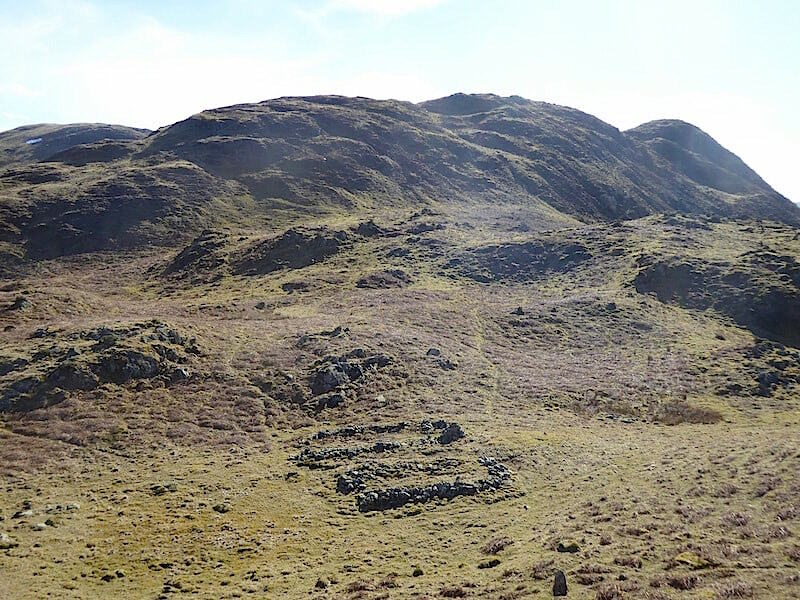 On our left are the bulky ridges of Smeathwaite and Birk Fell and between them and us are these two puzzling and parallel ruined structures about whose age and purpose I can find no information. After dropping down to the ruins we followed the track going to the left between the two outcrops. 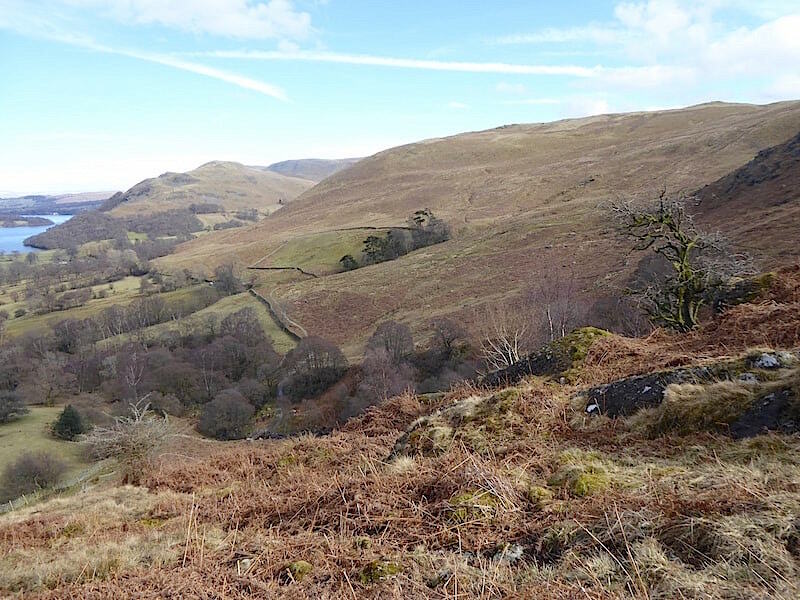 Gowbarrow Fell from Kilbert How …..
….. and a look back towards Low Birk Fell. The route across was just trodden grass but it was clear to see and follow although it may only have been a sheep trod. 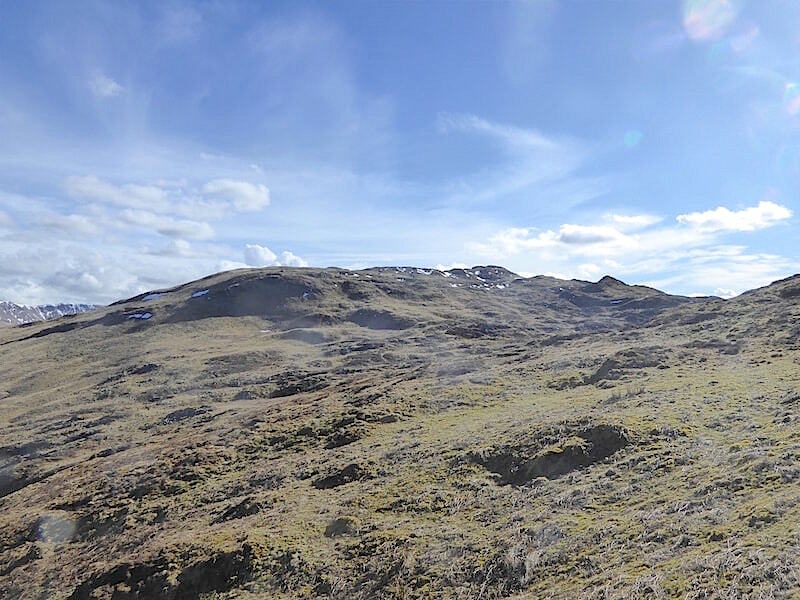 A look back at Kilbert How and the two ruins. Even after a close inspection of them we were none the wiser about their purpose. 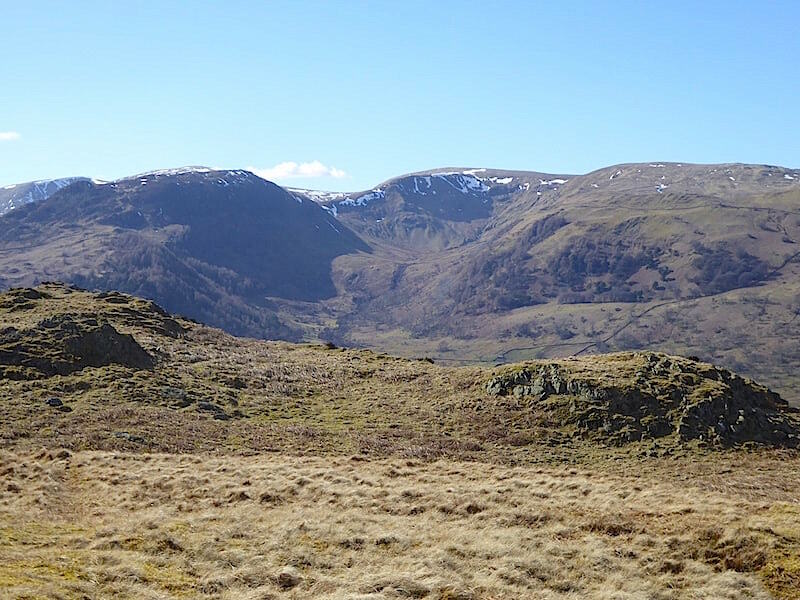 A look back to Low Birk Fell as we make the short crossing to begin the next climb over Smeathwaite. 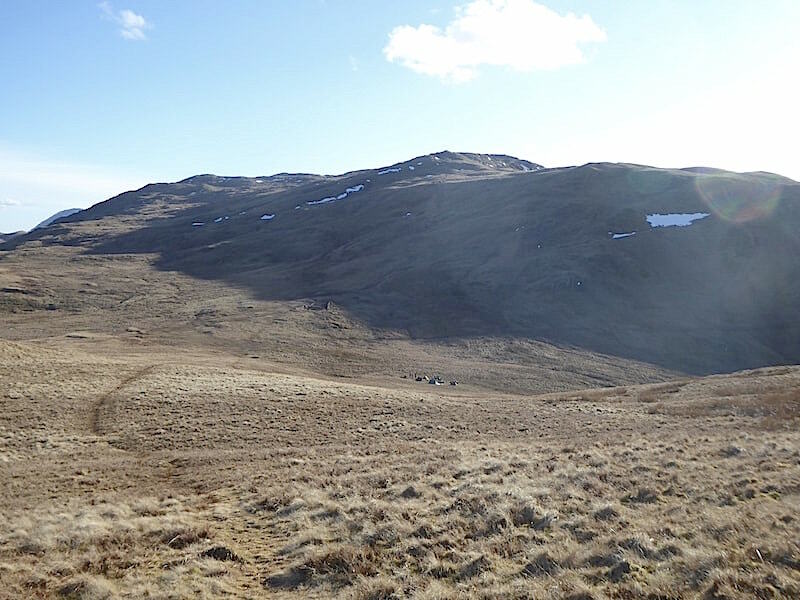 The sheep trods across the slopes are clearly visible, come the summer this will be a sea of green and finding any path or sheep trod will be like looking for the proverbial needle. Climbing over Smeathwaite and a view across to the disused quarry below High Dodd. 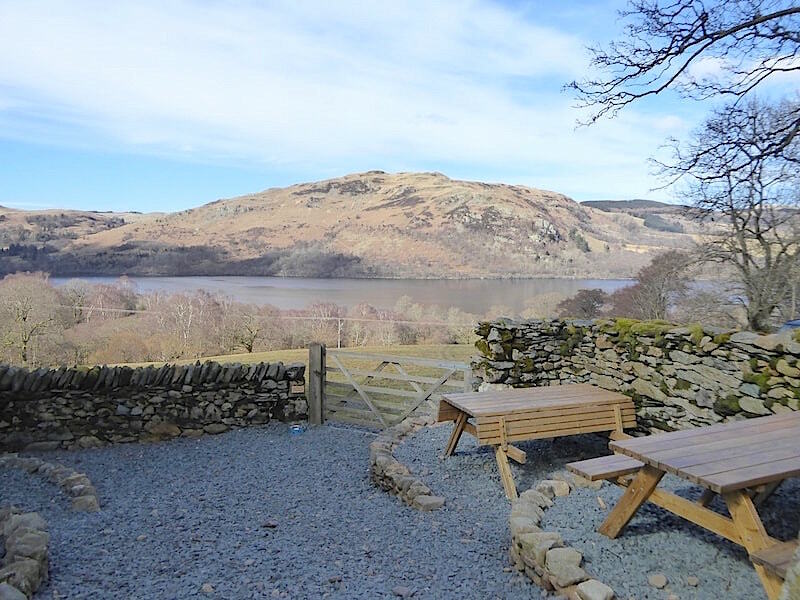 The path from the tea room goes straight through it which provides an opportunity to do a little exploring of the area before carrying on to Low Moss. Beyond the little col of Low Moss the long line of fells leading up to High Street are beginning to show. 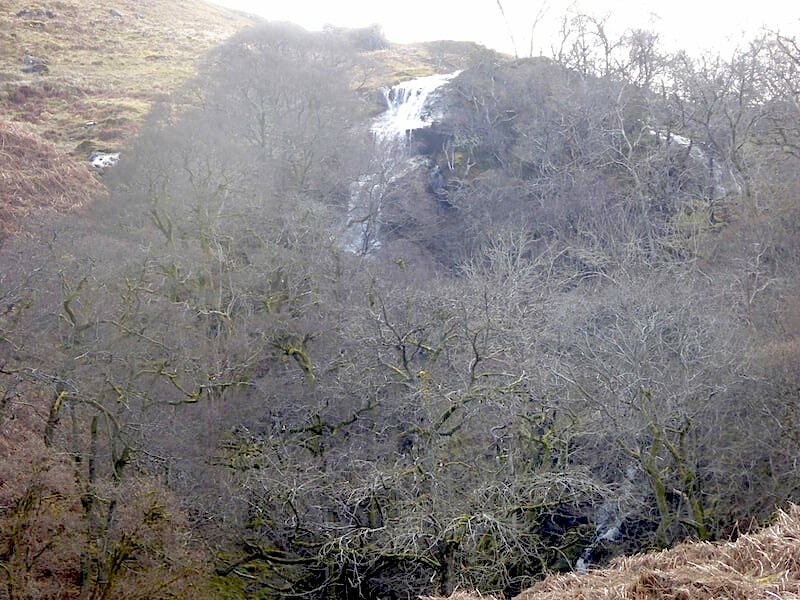 Practically in the centre of the shot is an old sheepfold situated on this side of Scalehow Beck although you might have to zoom in to see it. 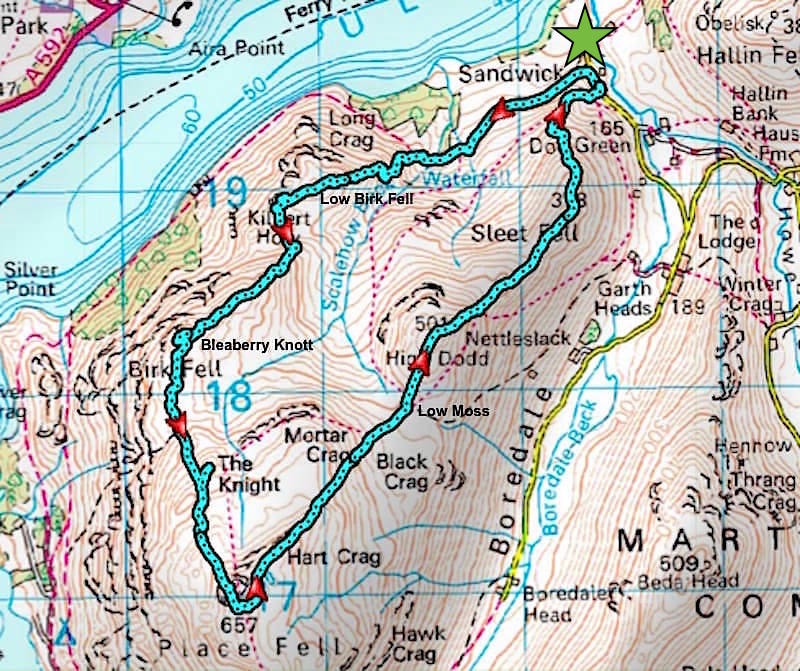 Not marked on our route map although it is shown on the OS map. 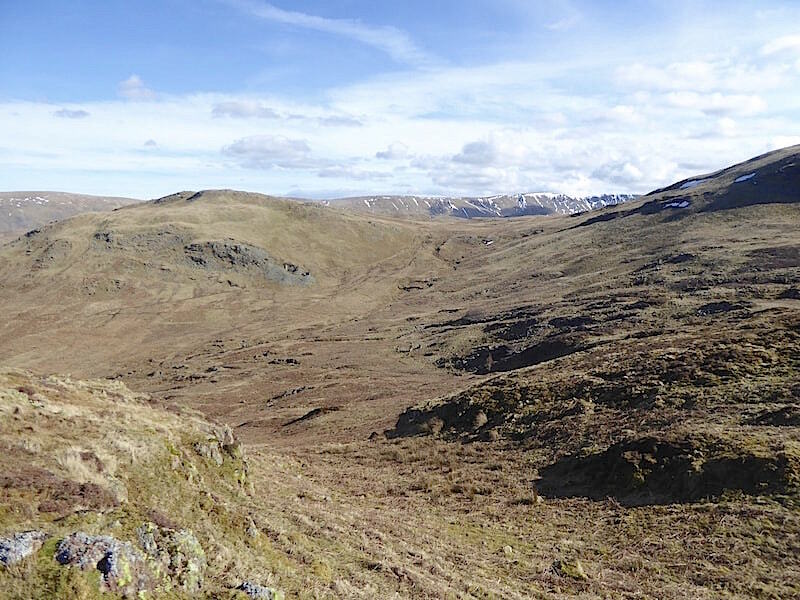 We continue the climb over Smeathwaite and a look across to our left only serves to remind us that The Knight and Place Fell summit are still quite a distance away with more warm work to come. Keep Calm and Keep Climbing. 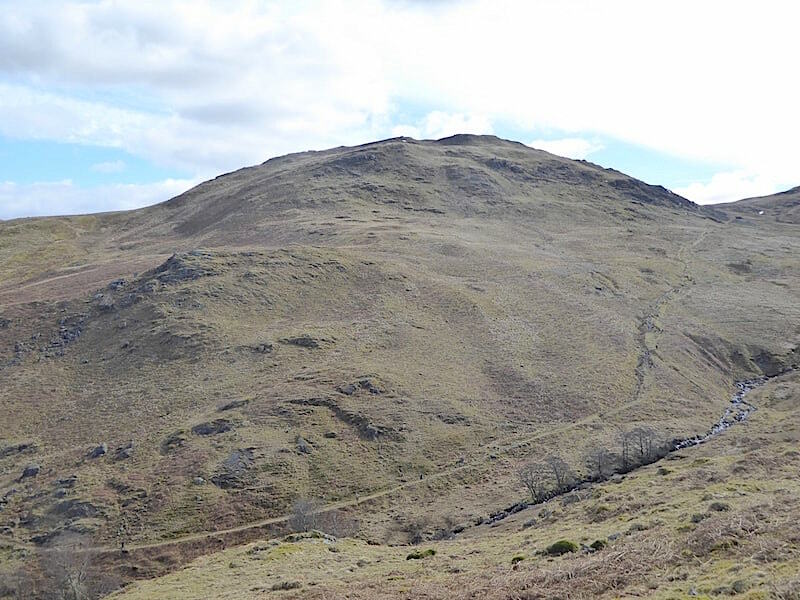 A level stretch of path from where we can view our next spot of hill climbing. 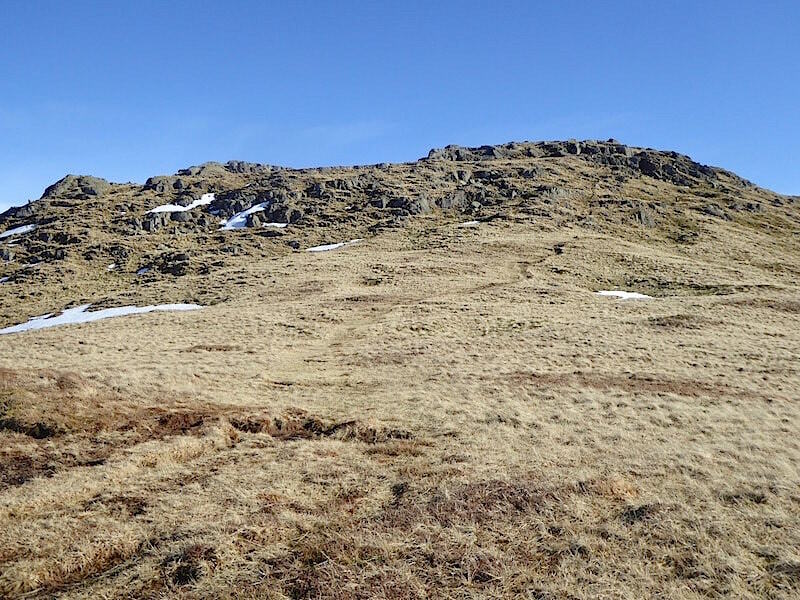 This is Bleaberry Knott, the summit of Birk Fell. The sun continues to blaze down but up here we now have a little breeze which helps to cool things down a little. Looking back at the enjoyable little section of path through a small depression between Smeathwaite and Bleaberry Knott. 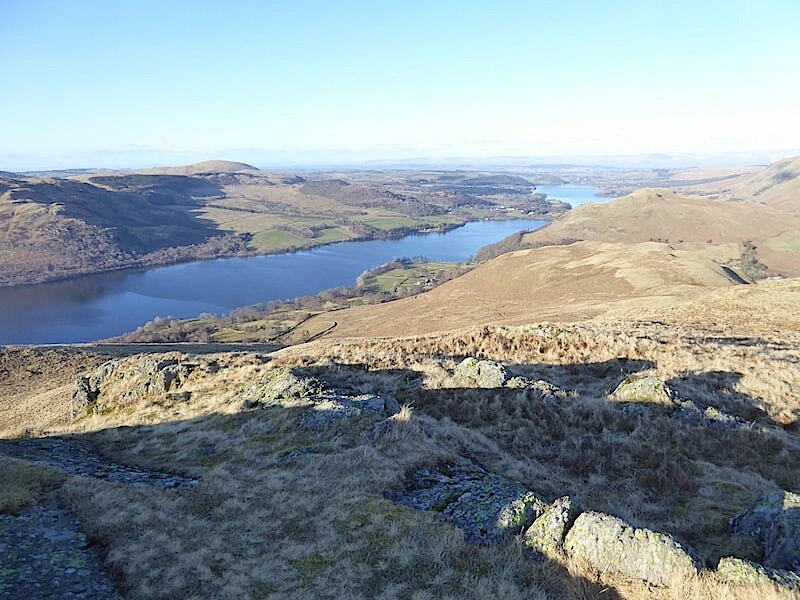 Climbing higher over Birk Fell now so time for a look back towards Smeathwaite, Low Birk Fell and Ullswater and a minute or two to give the legs a rest. 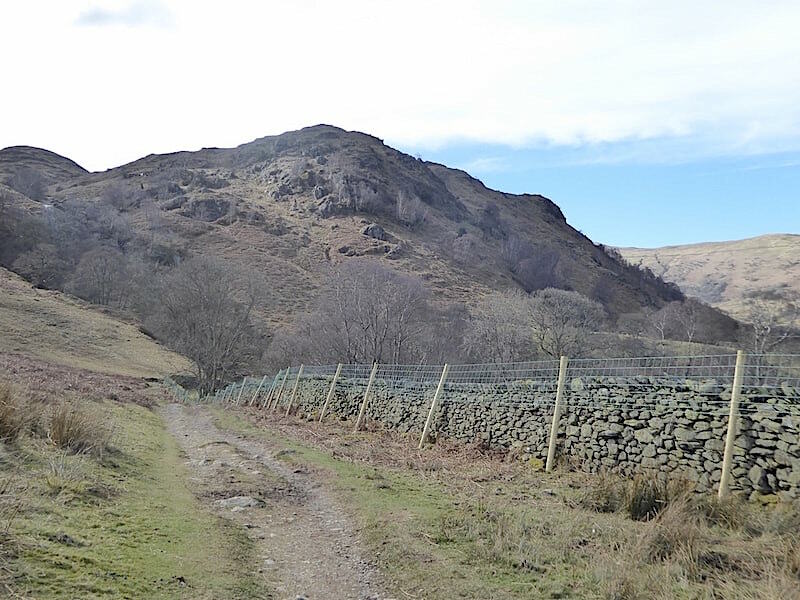 I think it might be clear why I mentioned that this route is almost one continuous climb, still the day is lovely, the views are fabulous and we aren’t in one long line of walkers all toiling up the same path. The last people we saw were the ones back at the Scalehow Beck footbridge. The summit of Bleaberry Knott where the bright sunshine is pretty much throwing everything to the west of us into deep shade. 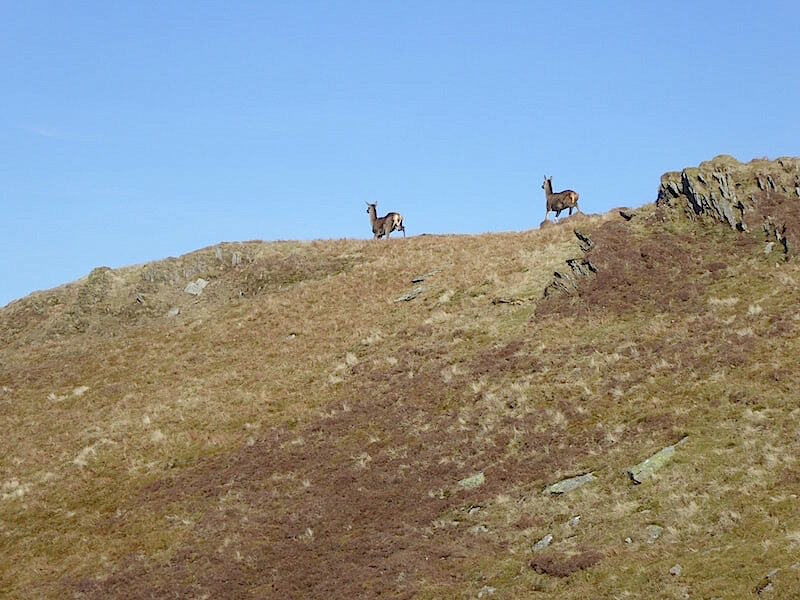 Its one of the drawbacks of climbing the far eastern fells on a sunny afternoon. 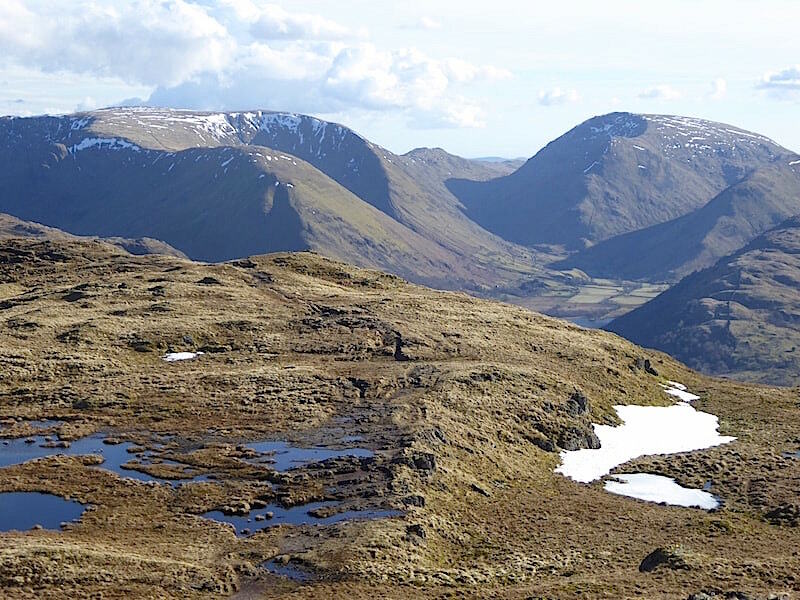 The slightly snow topped shadowy fell just above the cairn is Birkhouse Moor leading to the somewhat snowier Striding Edge ridge behind it to the left, and just peeking up to the right behind Birkhouse Moor is the pointed top of Catsty Cam. On the skyline beyond both of them is the Helvellyn range which I suspect would have been a very popular destination today. 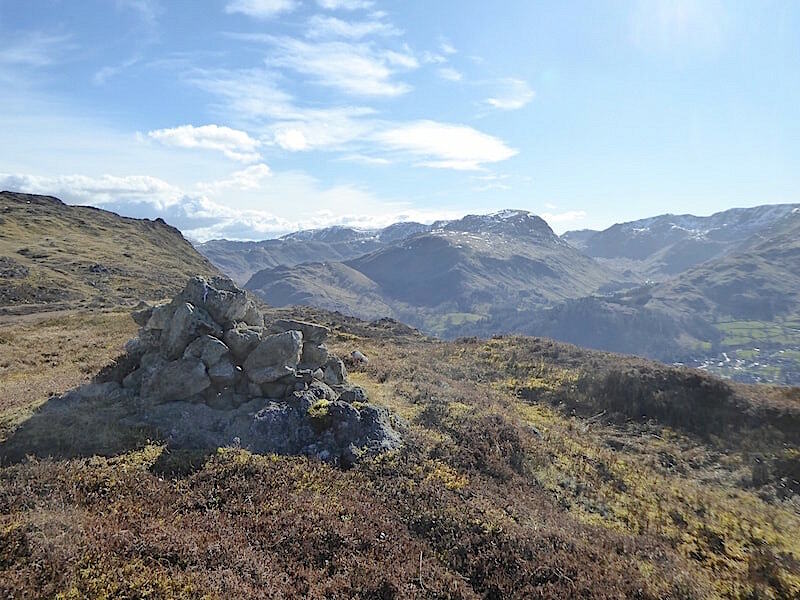 Another attempt to foil the sunlight this time looking at the fells rising just to the right of the cairn, which are, in ascending order, Arnison Crag, Birks and Saint Sunday Crag. Over to the left and The Knight and Place Fell seem as far away as ever so we’d better get a move on …..
….. although it is a bit tricky to get much of a move on because the bit between here and there is riddled with marshy, squelchy, boggy stuff which we would very much like to avoid sinking up to the ankles in, so we have a good look first and try to plot some sort of a dryish route. 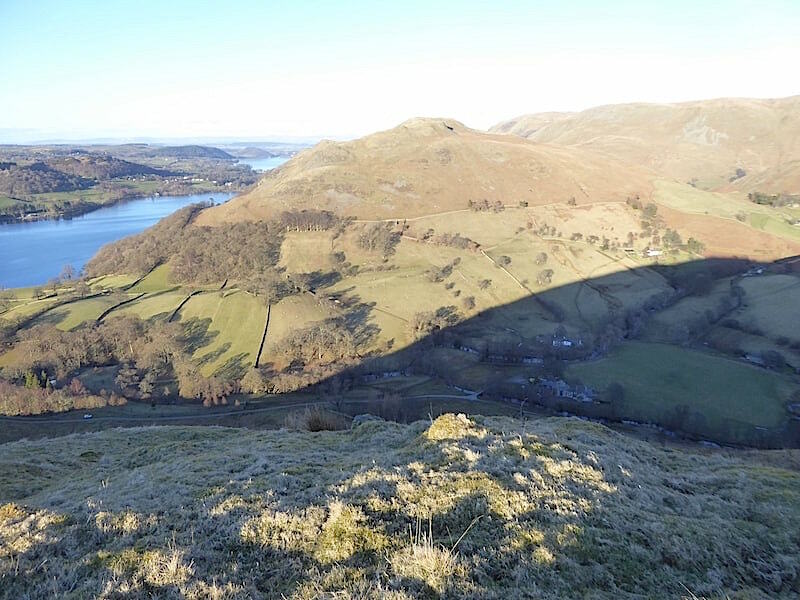 A look down across Hare Shaw towards Glenridding before dropping down off to the left of the shot for the crossing of the soggy patch, marked on the OS map as Bottom Heads. 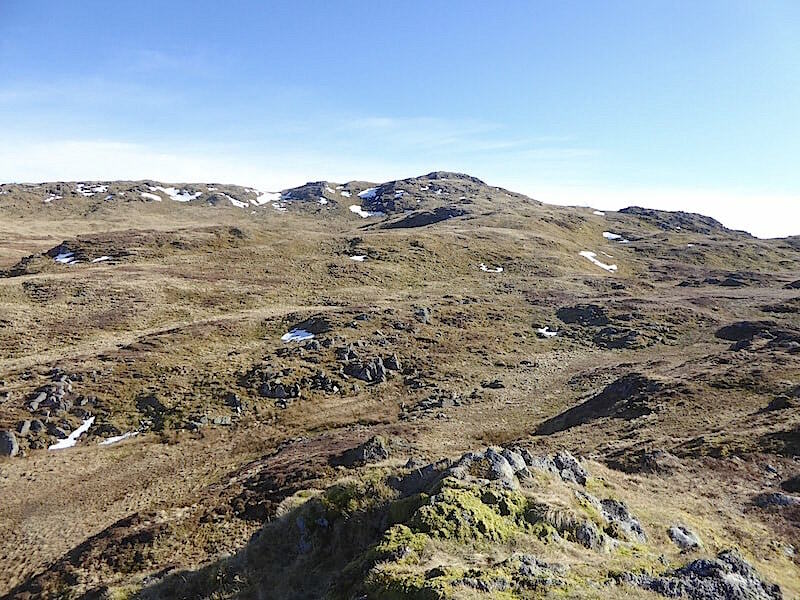 So far so dry, as we drop down from Bleaberry Knott through the heather and the outcrops, with a look back at it before we negotiate the wetter areas. We pick our way carefully across Bottom Heads just as plenty of other feet have done before us as there were lots of little patches of trodden grass which skirted the very wettest parts. Sheep usually seem to find the best way through so their trods can often come in very handy, the only downside is that the sheep aren’t usually going in the same direction you are so its a case of not letting the sheep lead you up the garden path, so to speak. 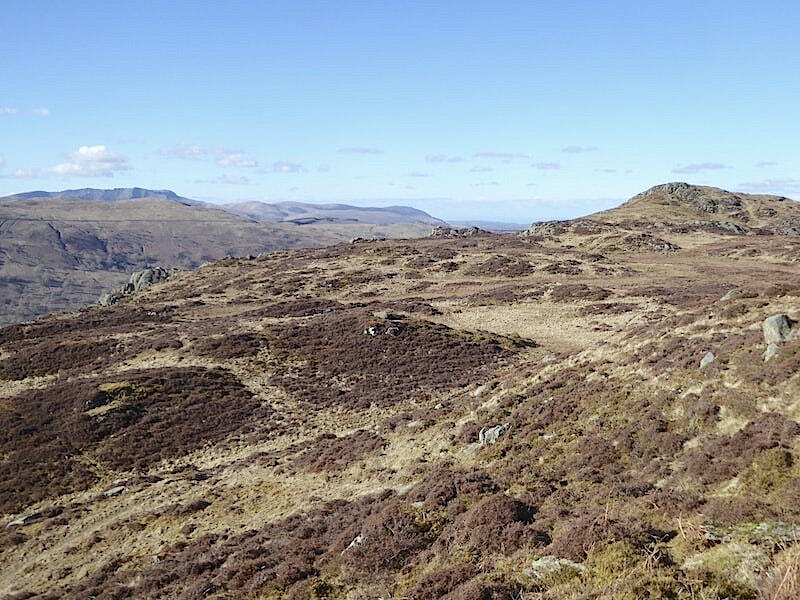 We pick up a well trodden path on higher and drier ground so I took a look back across Bottom Heads to Bleaberry Knott. The patches of heather are useful dry places to aim for but there are quite a lot of gaps between them which look brown and bone dry. Don’t believe them, they aren’t. We leave the path at this point and make a short diversion over to The Knight although this isn’t a shot of it. 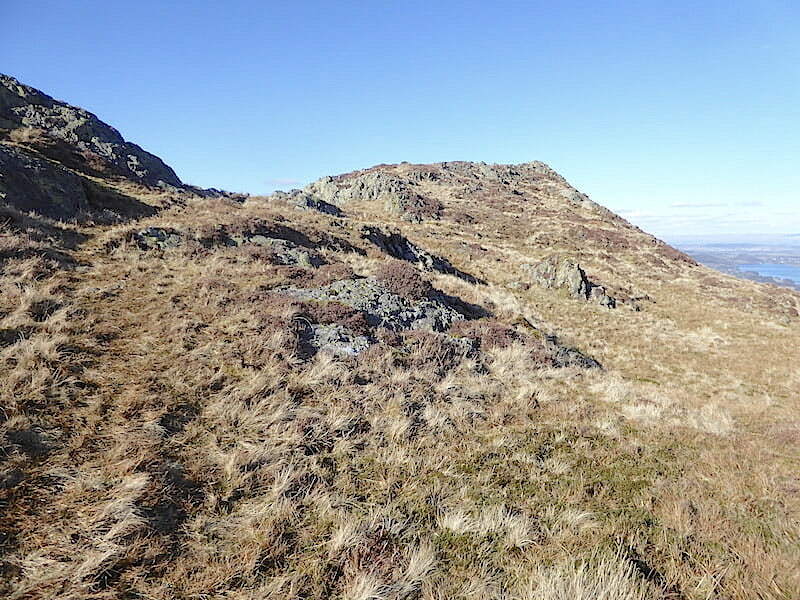 This shot shows the approach route and following the path through the outcrops leads on to …..
….. the peaked top of The Knight which is only a couple of minutes walk away and from where …..
….. there are some very extensive views from this mini peak which is set a some distance below the summit rocks of Place Fell. 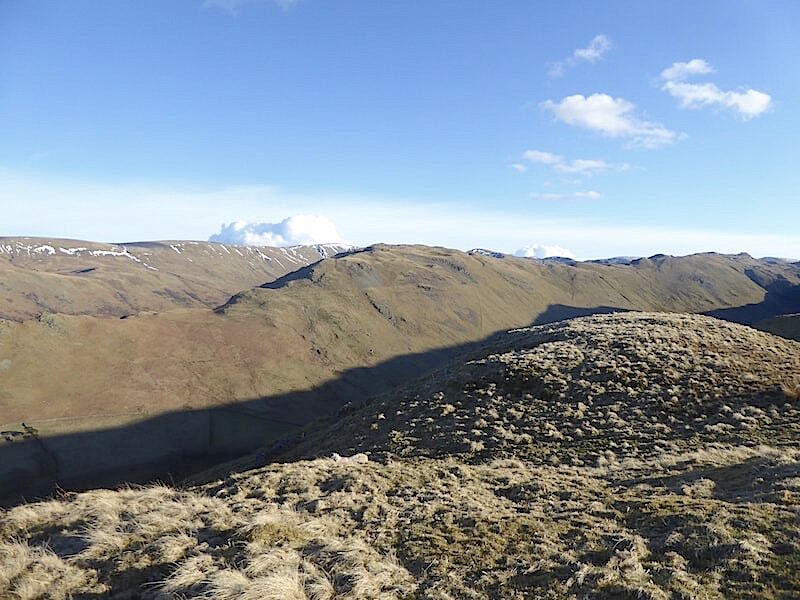 It almost feels like a separate fell since it there is a good deal of open landscape between it and the other subsidiary tops on Place Fell. 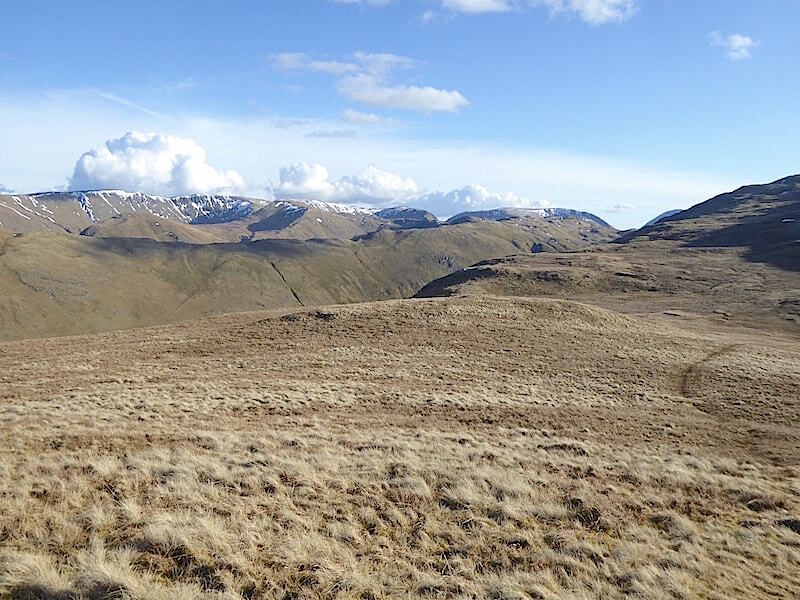 Blencathra on the distant skyline as I take a look back across the undulating landscape around Hare Shaw. 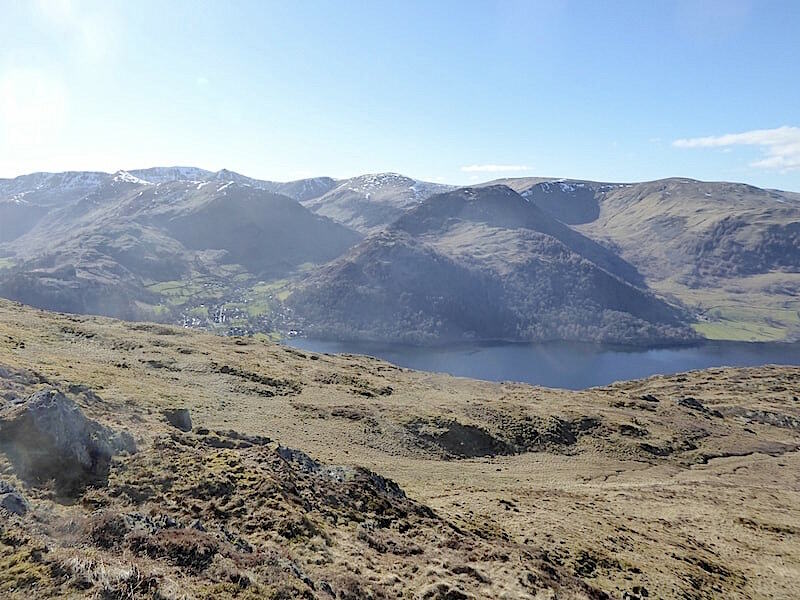 More or less in the centre of the shot immediately opposite us is the diminutive Glenridding Dodd and its loftier big brother Sheffield Pike. 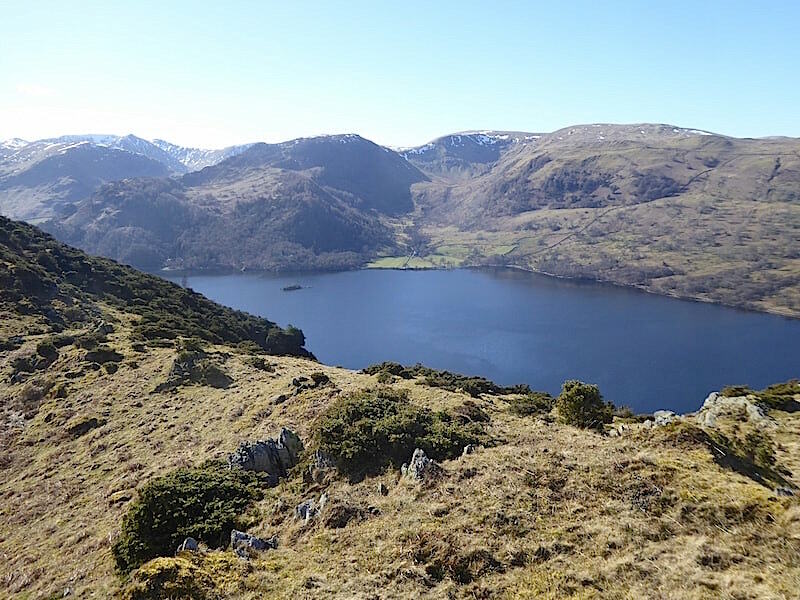 To their left is Birkhouse Moor and nestling snugly between them is the village of Glenridding. Having a breather and taking in the views from The Knight before we carry on climbing. 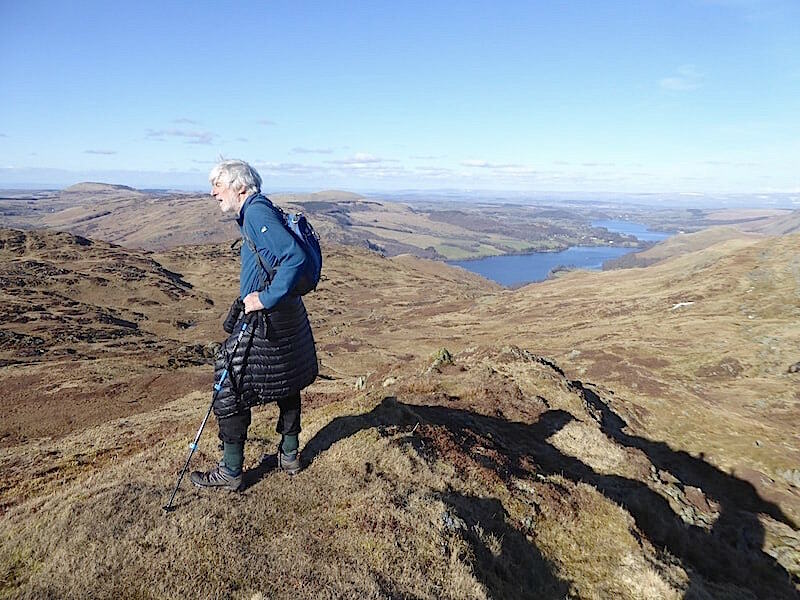 A quick about turn and then we follow the path going down to the left leading from The Knight back to our previous path …..
….. and the last bit of uphill work, together with a little more bog-hopping, before reaching Place Fell summit. Looking ahead as we crossed over I suddenly spotted a couple of heads sporting very large ears peering at us over a rocky escarpment. I got the camera out as quickly as I could, zoomed in on them and managed to get four shots as they turned and walked fairly casually away from us. To see them is such a rare treat since they generally turn tail and run away the minute they catch sight of you. This was the best of the four shots I took. 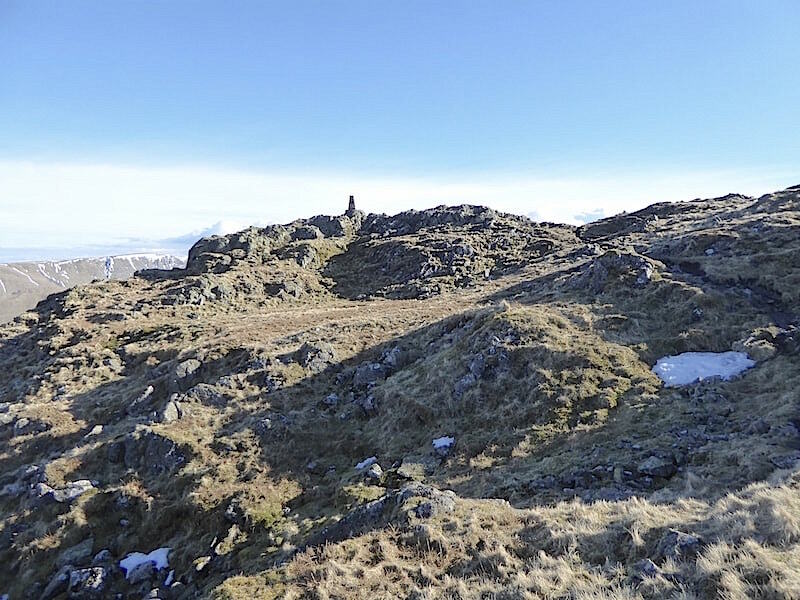 A clear path leads across the grassy slopes below the rocky summit …..
….. and it isn’t long before the trig column comes into view …..
….. together with the tarns situated just below it. Just leaving the summit area was a family group, Mum and Dad with their three young children plus the family dog. 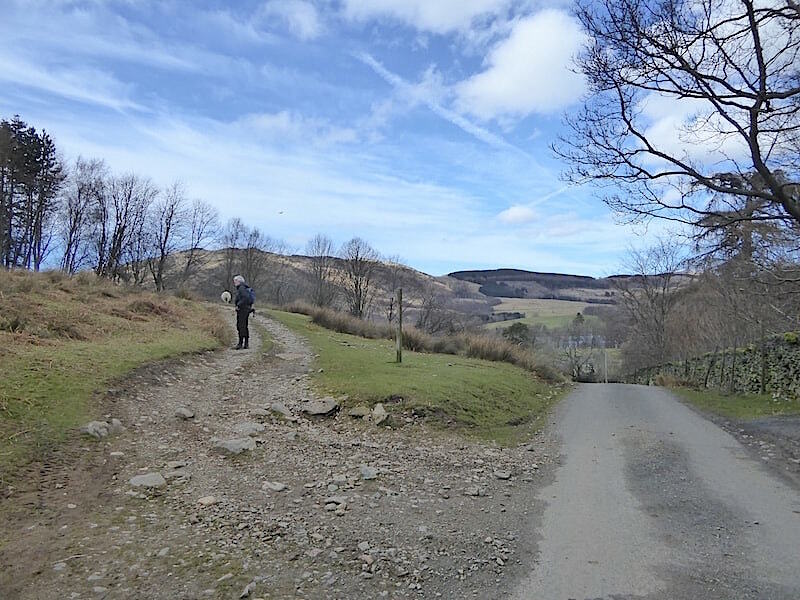 Dad checked their route back down to Patterdale with us and Mum stopped to exchange a few words with us before they both had to quickly carry on and catch up with the youngsters who had already gone some distance ahead. That left us with Place Fell summit all to ourselves with no sign of anyone else on any path in any direction. We found a couple of reasonably comfortable rocks to sit on, got out the coffee and sat enjoying the views for five minutes or so. Clear views to the south from the trig column. 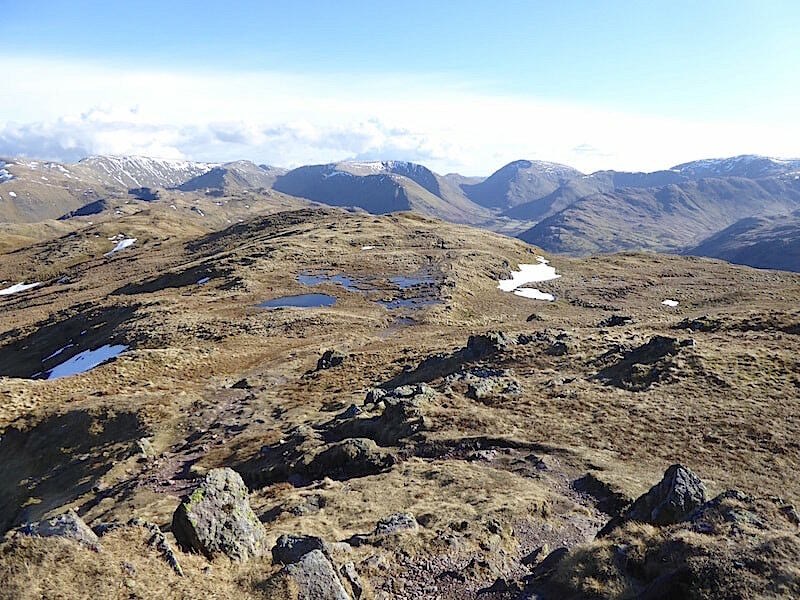 I think this is the first time we’ve been up here with not another person in sight, although there would have been plenty of walkers up here earlier I suppose because its quite a popular walk from Patterdale. 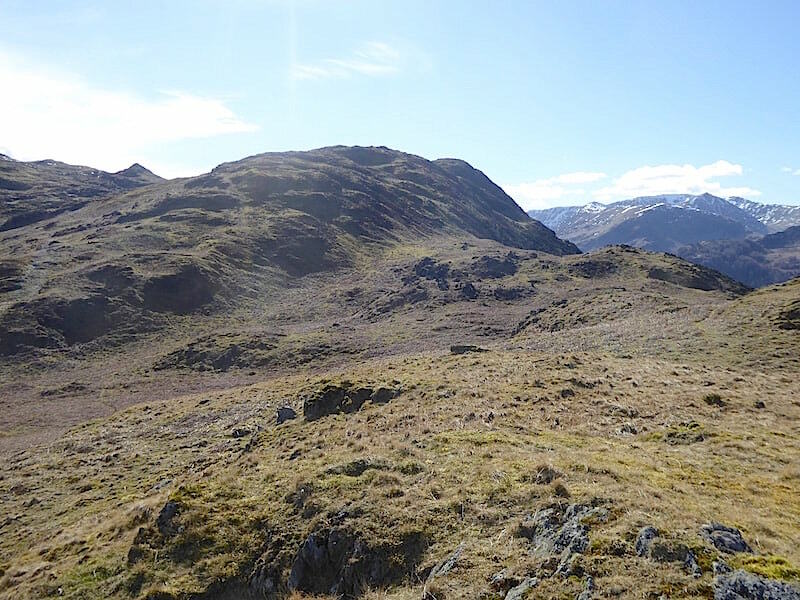 As they were standing out so clearly I took a closer look at Hartsop Dodd and Caudale Moor on the left, and Middle Dodd and Red Screes on the right. Our jackets went back on while we were sitting here having our coffee break where a slightly stronger breeze was swooshing around and re-organising my hair into an unruly mop style. The winter weight trousers had been rolled up ages ago and this was the only time the jacket was needed. 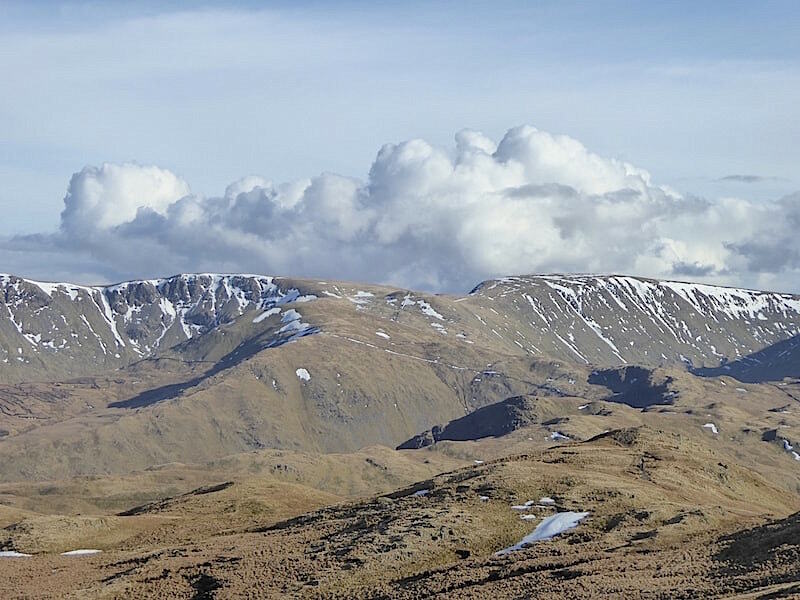 A dramatic cloudscape forming above Rampsgill Head and High Street. 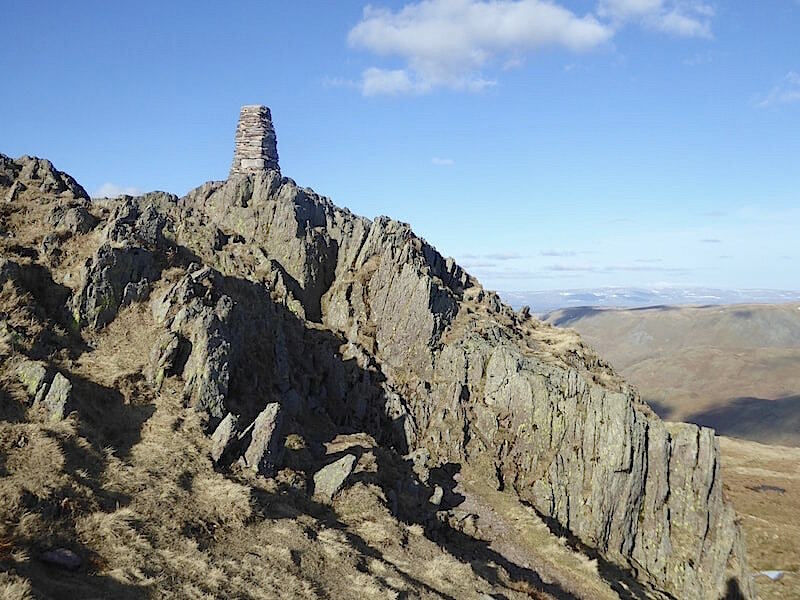 The trig column sits impressively atop Place Fell’s rocky plinth. Coffee break being over off we go again and make our way down to …..
….. pick up the path alongside the Place Fell tarn where we can look forward to a spell of downhill walking for a change. 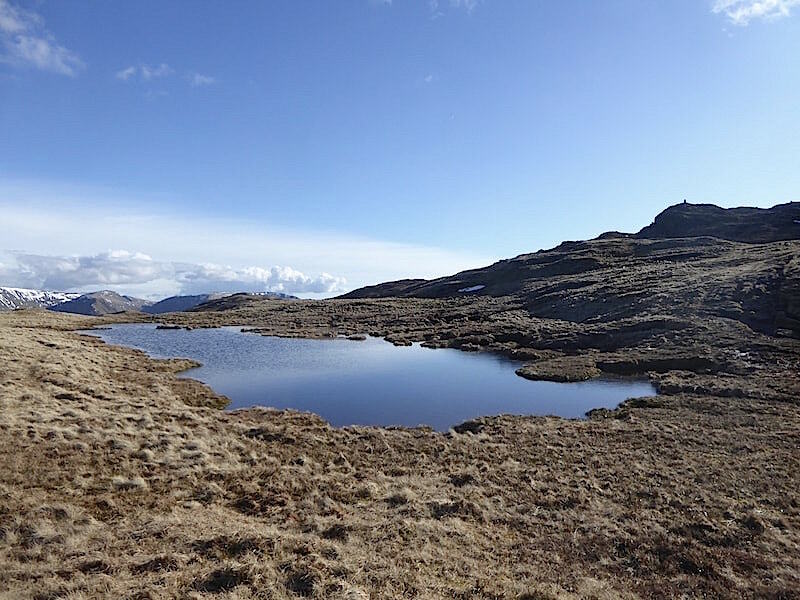 A look back at the tarn and Place Fell summit before we lose the view. 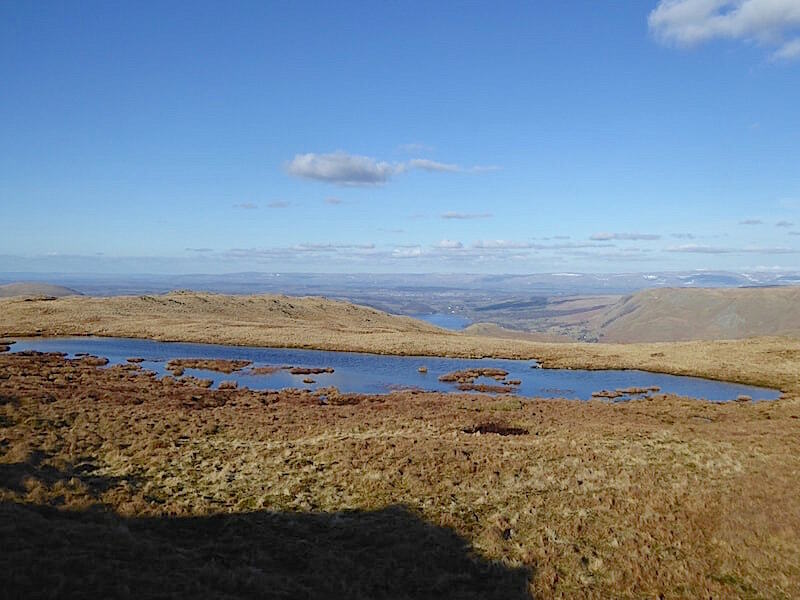 A short spell of walking in the shade as we drop down and make our way over to Low Moss. Once we were out of the breeze and back in the sunshine the jackets just had to come off again. Before too long we were down at the sheepfold at Low Moss but there’s another marshy area and the climb up to High Dodd ahead of us. Climbing up to High Dodd with the cloud activity still going on behind us around the High Street range. 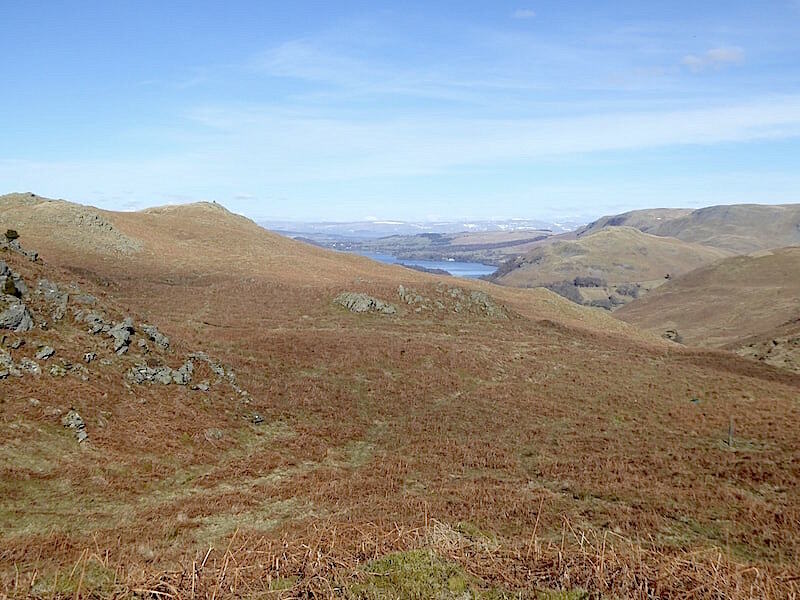 The eastern side of Place Fell in deep shade now as we continue up High Dodd. Alongside the path at Low Moss was a little group of campers who looked as though they intended spending the night there, hope it didn’t get too chilly for them during the night. 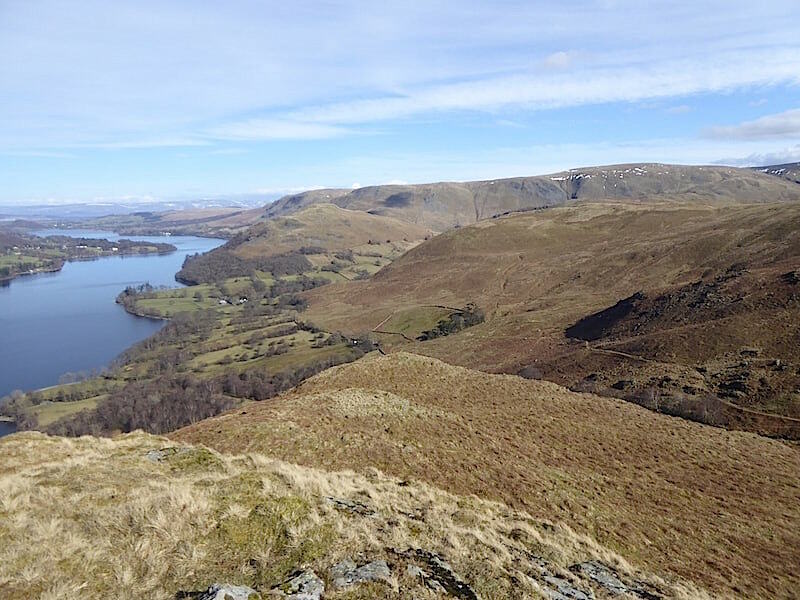 We reach the top of High Dodd and gaze down on the lovely views of Ullswater once again. From here we drop down quite steeply to Sleet Fell immediately below us to the right. 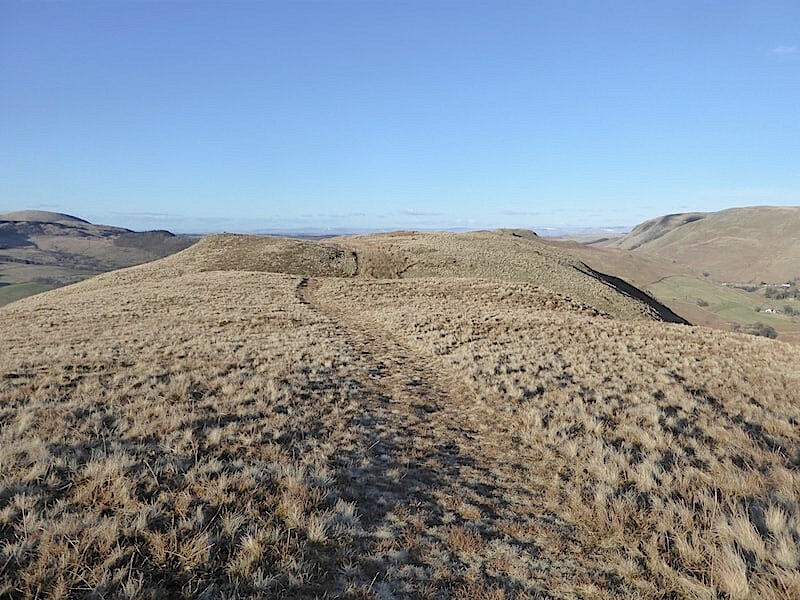 Having dealt with the steep downhill section off High Dodd there’s a stretch of gently undulating moorland to enjoy tramping along. Very pleasant walking in the afternoon sun. 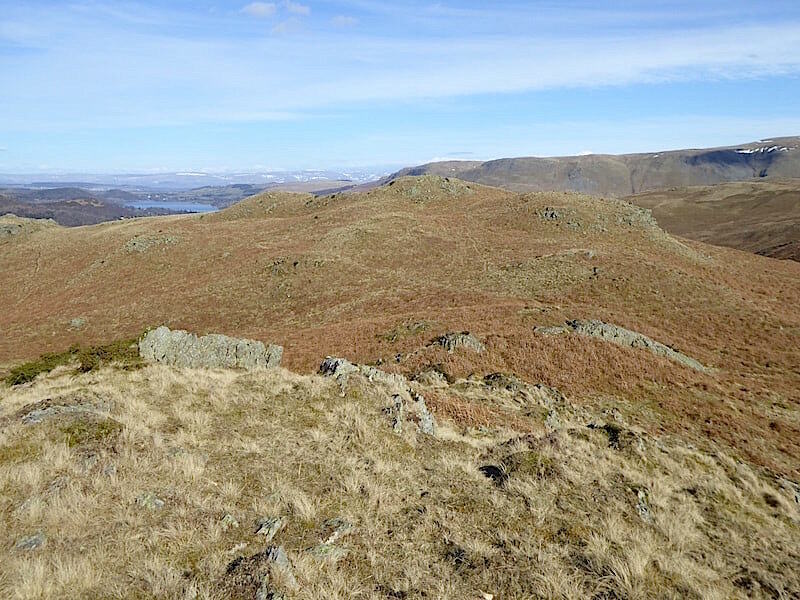 Beda Fell immediately on our right as we tramp across Sleet Fell. 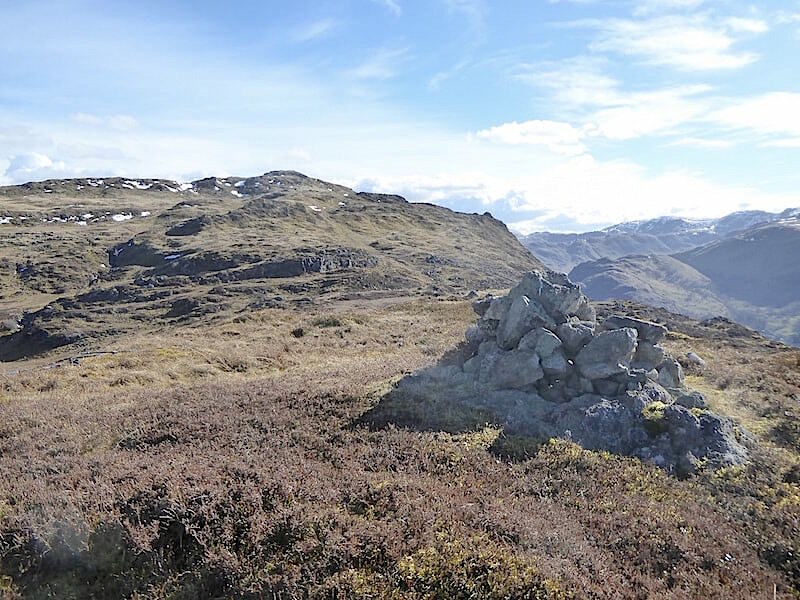 The cairn on Sleet Fell’s summit which is perched on the edge of the fell above Cat Crag. 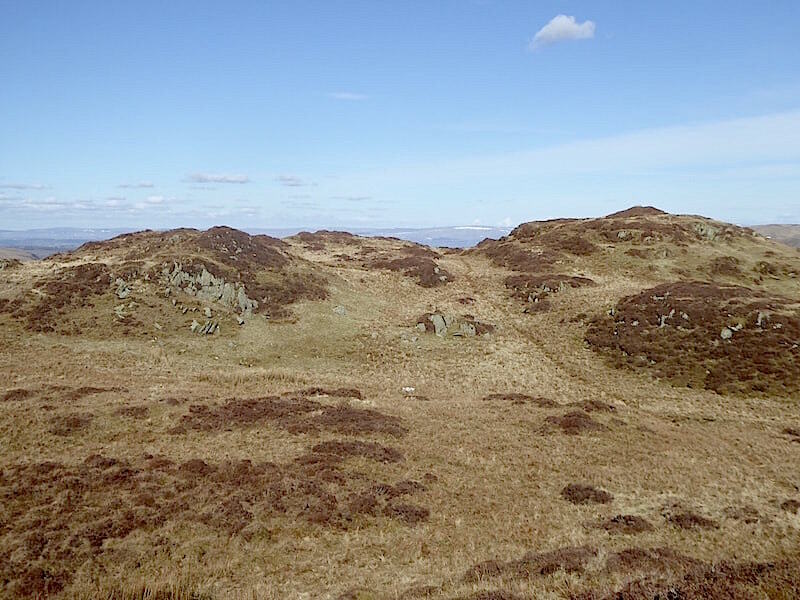 We now have to veer over to the left of the shot and follow the path back down to Sandwick. The afternoon sun creates a lovely light across the fields and trees around the little hamlet of Sandwick. A view to feast the eyes on as we make our descent. Parked on the roadside below the car awaits our return. Hallin Fell on the other side of the road gets the full benefit of the sunlight, but the hamlet of Doe Green below it isn’t quite so lucky. Not much further to go now but we can still enjoy this lovely view all the way down, a beautiful sight at the end of a grand walk. Peggie’s Seat, according to the plaques attached to it. One to commemorate Peggie’s 80th birthday and the other in remembrance of her death in 2006 aged 96. 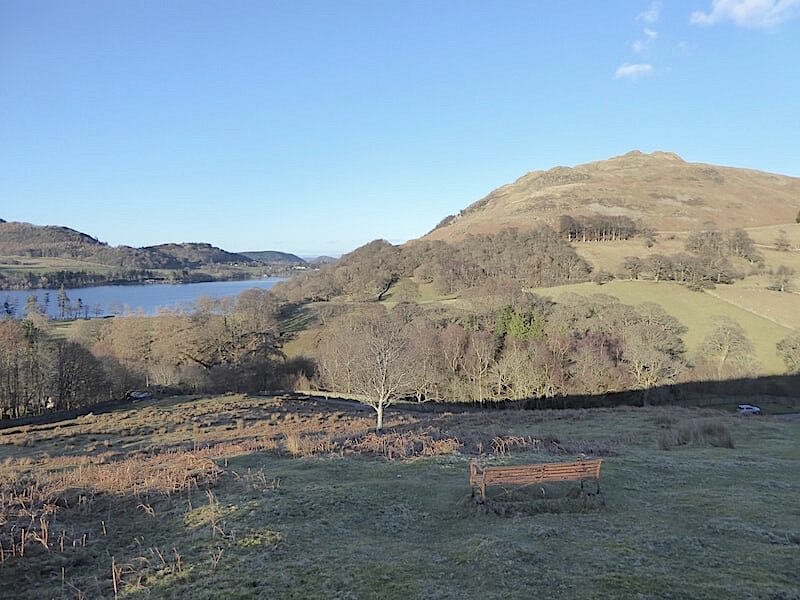 A local lady resident who must have enjoyed making the short walk from the road up to the seat to sit for a while and enjoy the lovely view, and having enjoyed it ourselves all the way down Sleet Fell we can well understand her love of it. All we have to do now is drop down to the car over on the left and we’ll have come full circle. 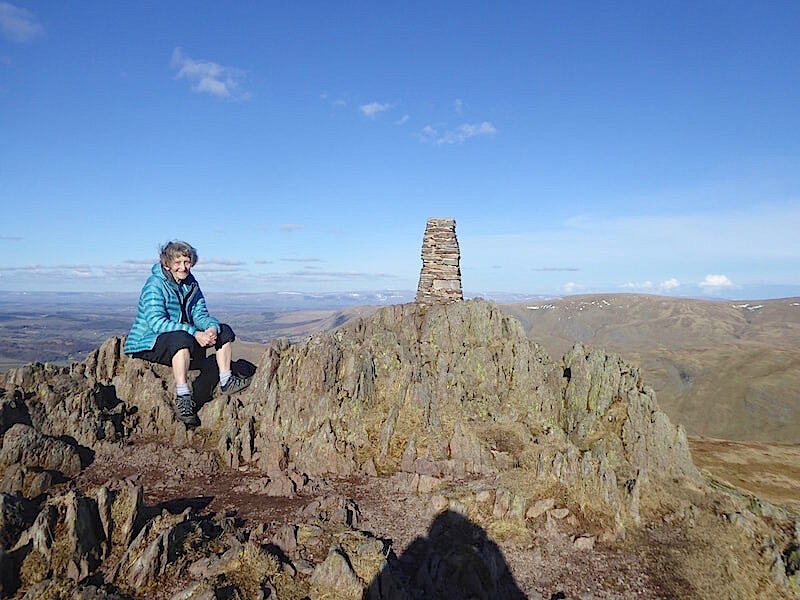 So that’s the end of our Grand Tour of Place Fell, not the easiest or fastest way to attain the summit, a circuitous, and sometimes testing, route but all the more interesting for that. Well, its getting on for tea-time so we’d better make our way home and get the kettle on.